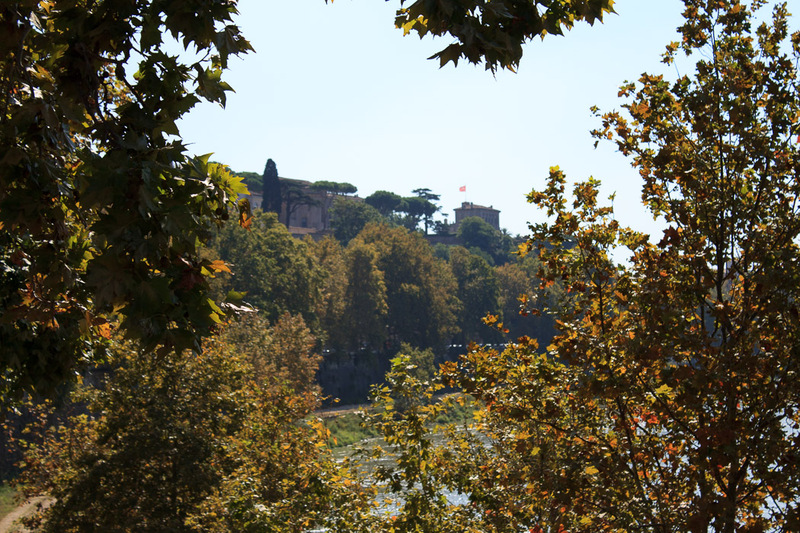 The Aventine Hill is the southernmost of the Seven Hills of Rome, with its tallest part being beside the Tiber River. 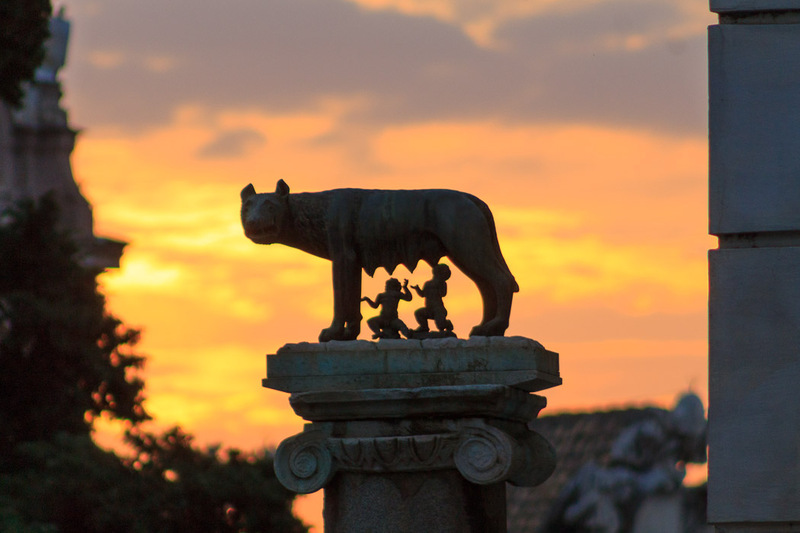 According to the founding legend of Rome, Romulus set up his camp on the Palatine Hill and Remus set up his camp here on the Aventine Hill. 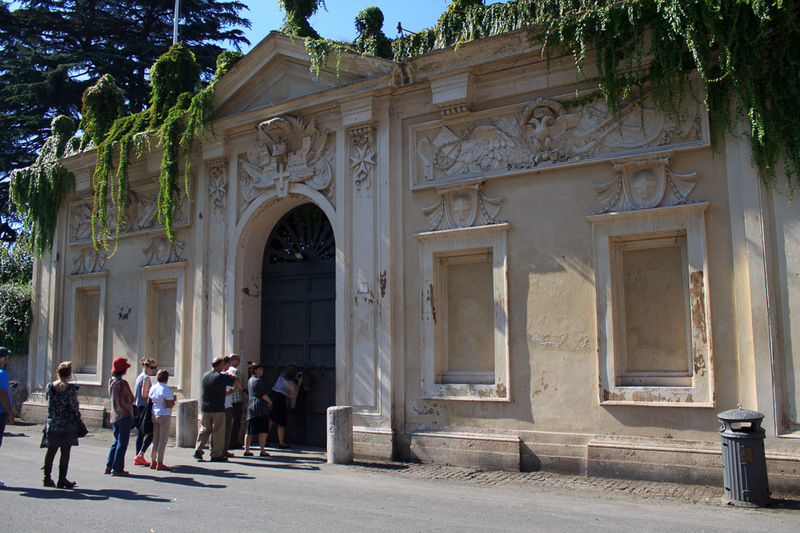 Perhaps the most popular tourist attraction today on the Aventine Hill is the Aventine Keyhole (2nd photo below). See all Aventine Hill photos. 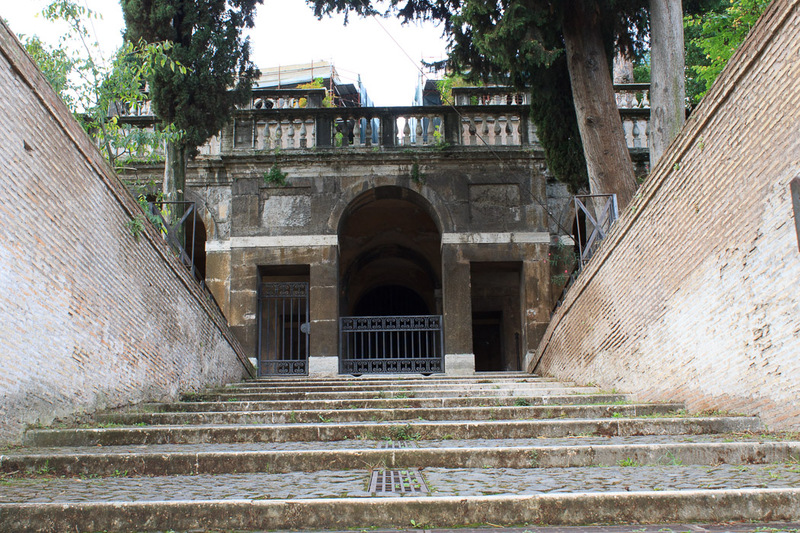 Other than that, the Aventine Hill is a beautiful residential area, with elegant homes, palaces and churches. And with beautiful views off that cliff on its northwestern edge, one of which is shown in the panorama below. 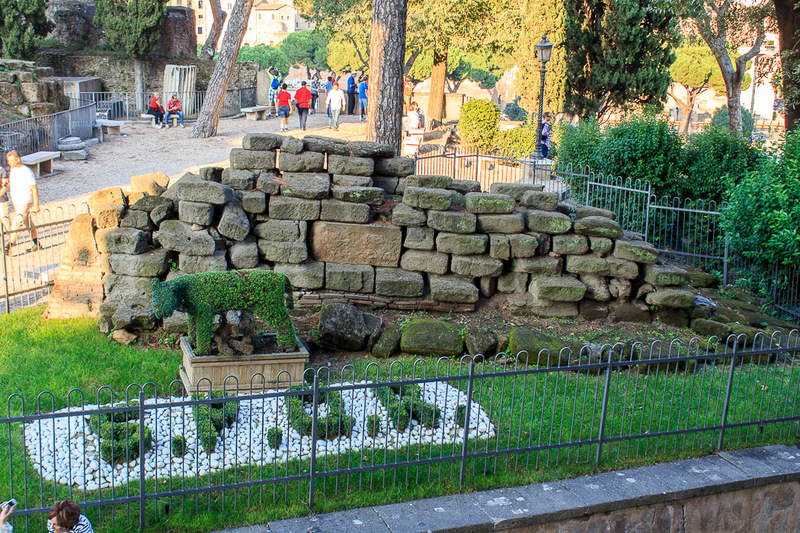 The Caelian Hill is one of the Seven Hills of Rome, located between the Colosseum and the Baths of Caracalla. During the Republican Era, the Caelian Hill was the site of residences of the wealthy. Maybe there are ruins here awaiting discovery. 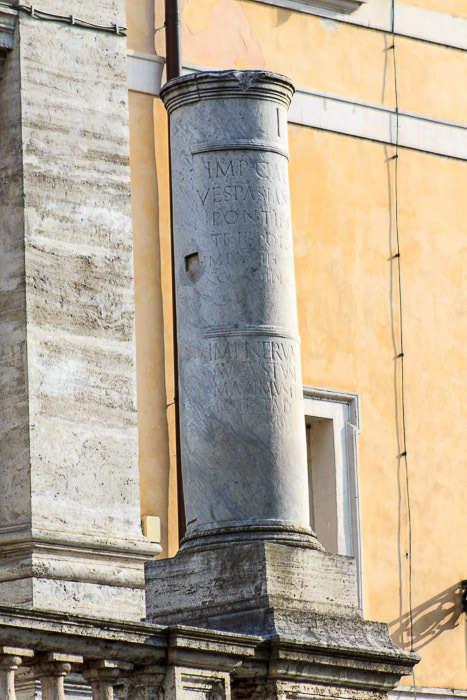 While you're in Villa Celimontana you can have a look at the Mattei Obelisk. Other nearby sights are Santo Stefano Rotondo, Arcus Caelimontani, Case Romane del Celio, Aqua Neroniano and the Palatine Hill. The spot that I selected for my panorama from the Caelian Hill is in Villa Celimontana, facing west (shown below). See all Caelian Hill photos. 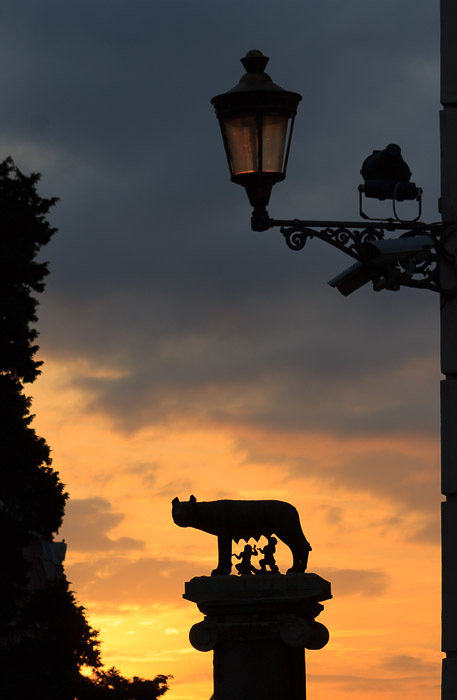 Location: The hill between the Roman Forum, the Victor Emmanuel Monument, the Campus Martius, and the Forum Boarium, accessible from Via dei Fori Imperiali via the road between Caesar's Forum and the Victor Emmanuel Monument, or from Via del Teatro di Marcello from the stairway to the right of the stairway to the church of Santa Maria in Aracoeli. 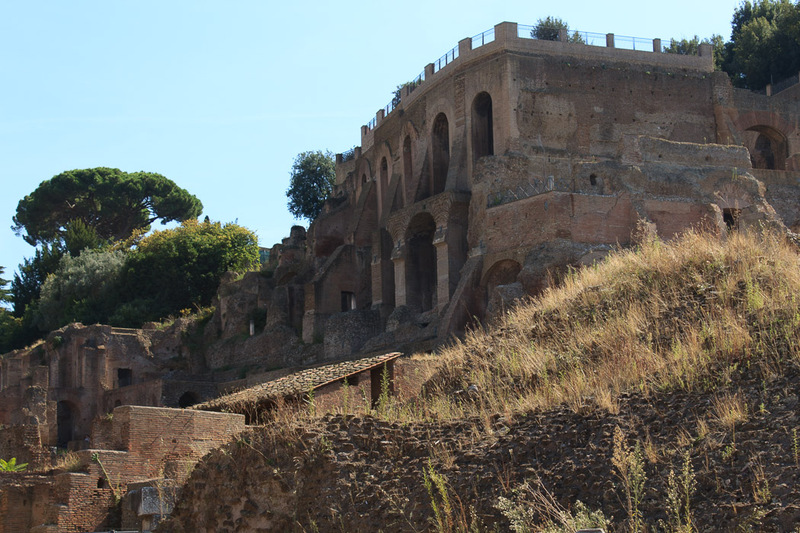 The Capitoline Hill is one of the two currently non-populated hills of the Seven Hills of Rome, along with the Palatine Hill. It was the the geographical and ceremonial center of ancient Rome, being the site of their most important temple, the Temple of Jupiter. 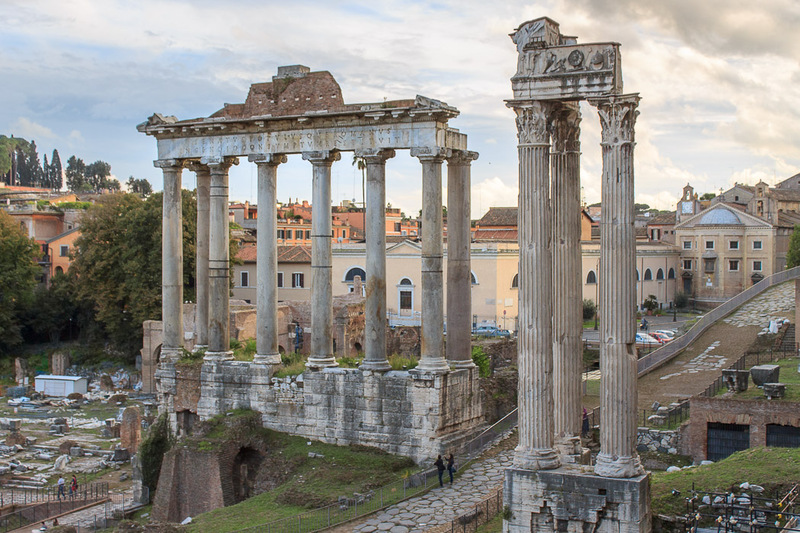 This temple towered over the Roman Forum, and its foundations can be seen today (1st and 2nd photos below) inside and outside the Capitoline Museum, which is the shining star of museums in Rome, and the primary attraction of today's Capitoline Hill. 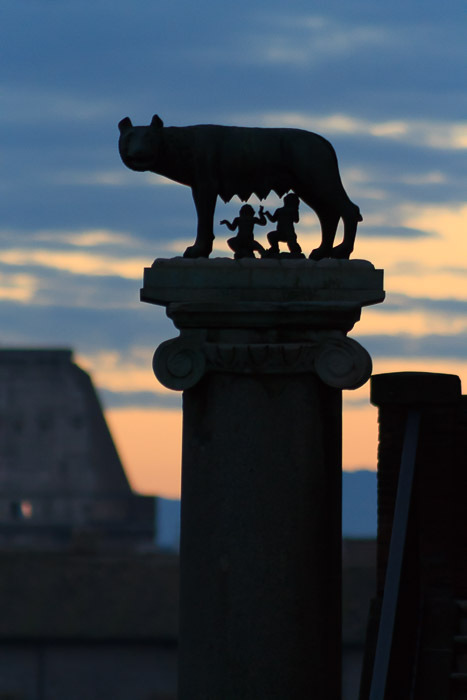 The hill and the Temple of Jupiter became symbols of Rome, the Caput Mundi (capitol of the world). 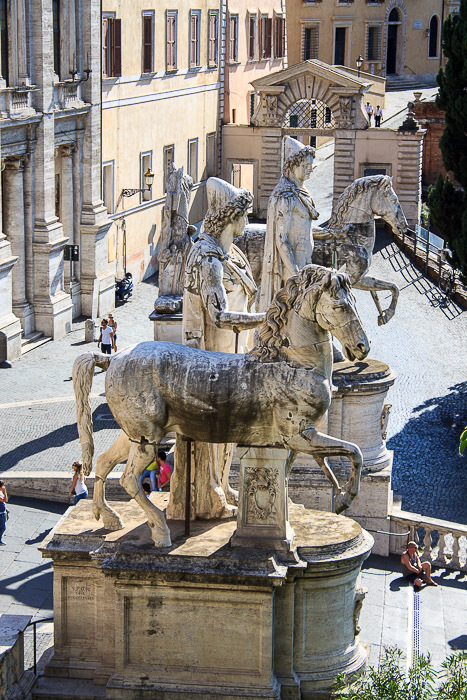 In ancient times, the Capitoline Hill was a natural fortress, with rocky cliffs on all sides and two crests on the top. 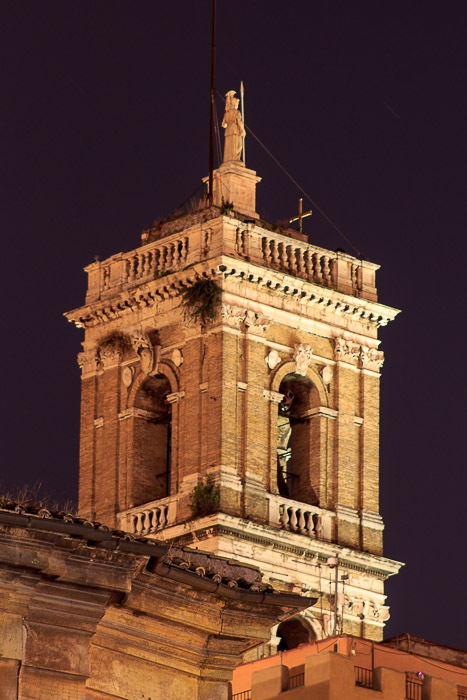 The northern crest, where the church of Santa Maria in Aracoeli now stands, was the slightly higher crest, and was called the Arx (citadel) and held the Temple of Juno. 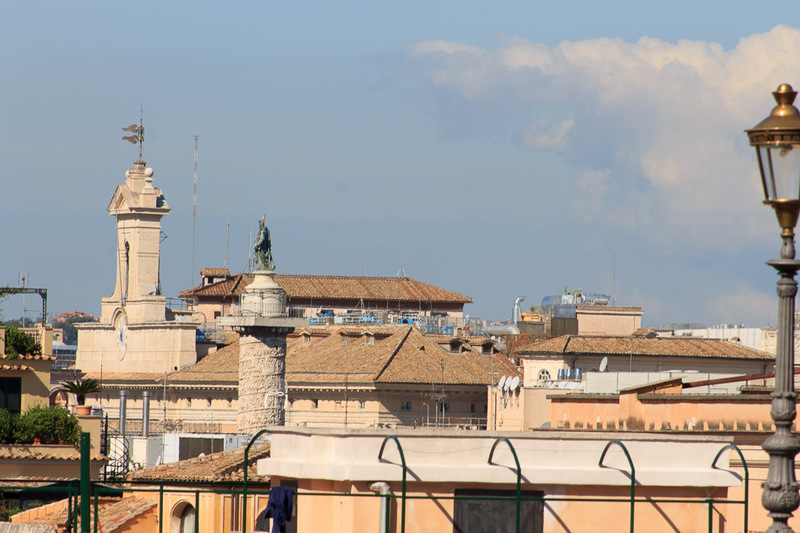 The southern crest, where the Palazzo dei Conservatori and Palazzo Caffarelli (the part of the Capitoline Museum furthest from the Victor Emmanuel Monument) now stand was called the Capitolium, and held the Temple of Jupiter. 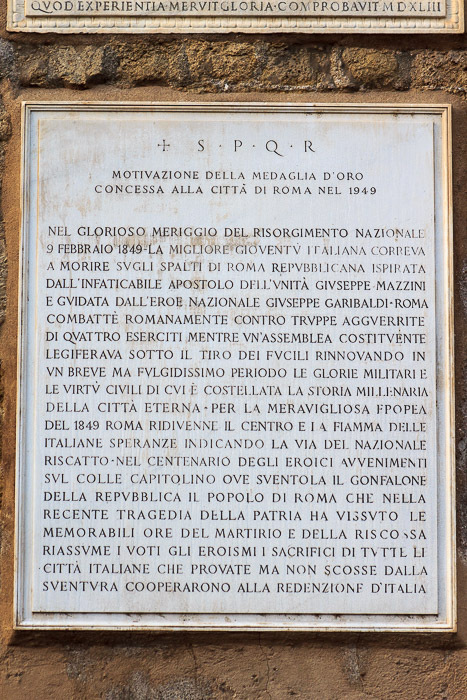 This end of the hill was reserved exclusively for religious purposes from a very early period, becoming the center of the State cult and the destination of Rome's military triumphal processions. 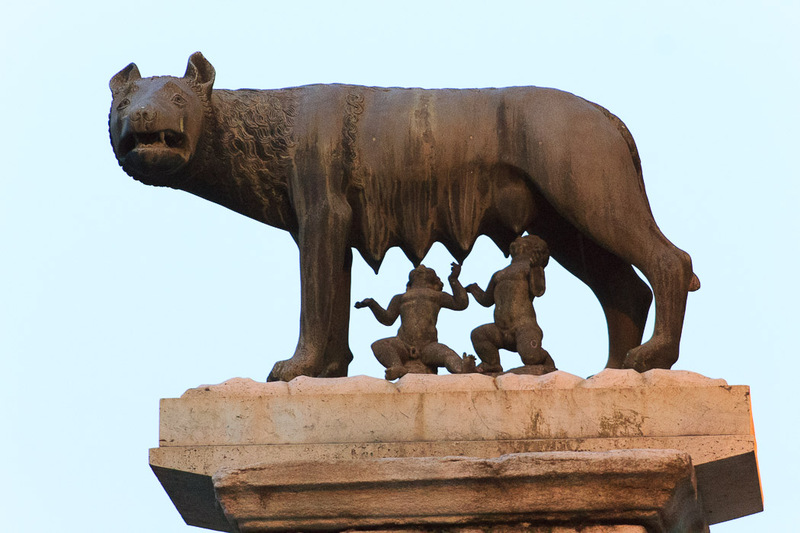 The saddle-shaped depression between the two crests was called the Asylum, an area where, according to legend, Romulus had declared a sanctuary to attract foreign refugees and increase the population of Rome. 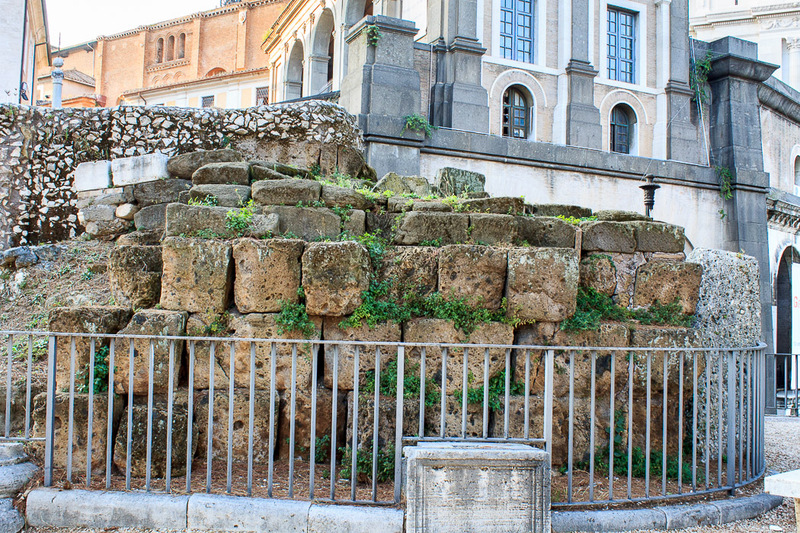 Since those ancient times, the hill's edges have softened and due to development, the hill mainly faces west to the Via del Teatro di Marcello today (3rd photo below), rather than facing east toward the Roman Forum (4th photo below) as it did in antiquity. The edges of the hill were steep enough that they were used for executions in ancient times. The northern part of the eastern edge held the Gemonian Stairs and the southern part of the eastern edge has the Tarpeian Rock. 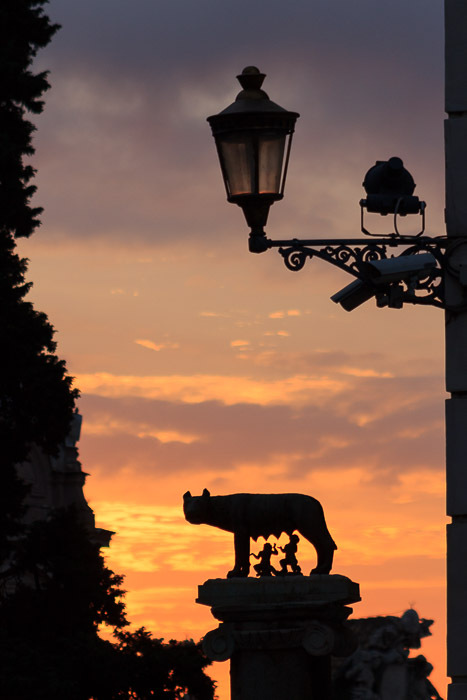 See all Capitoline Hill photos. The Piazza del Campidoglio, or simply Campidoglio (1st photo below, just for fun), is the modern piazza at the spot of the ancient Asylum, designed by Michelangelo in 1536-1546 and finally completed during the 17th century, except for the paving which was finished during the 20th century by Mussolini in accordance to Michelangelo's design. 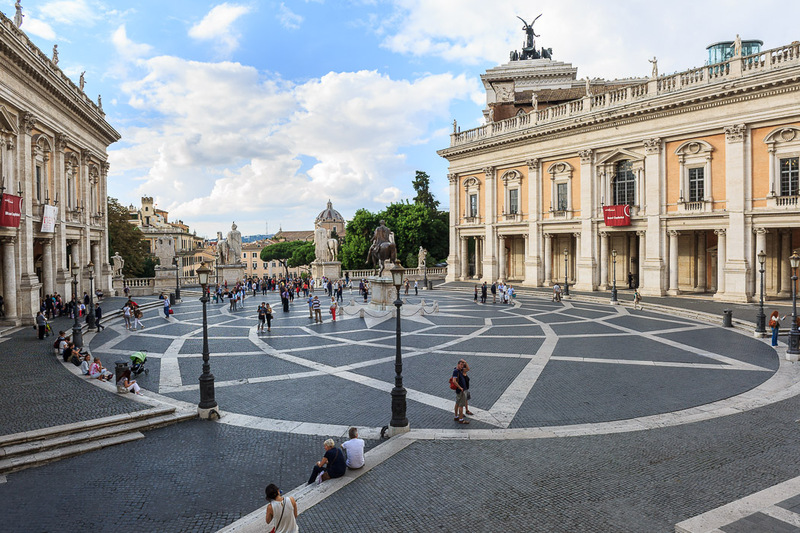 The star-shaped paving stones on the Campidoglio (2nd photo below), designed by Michelangelo, form one of the symbols of Rome. 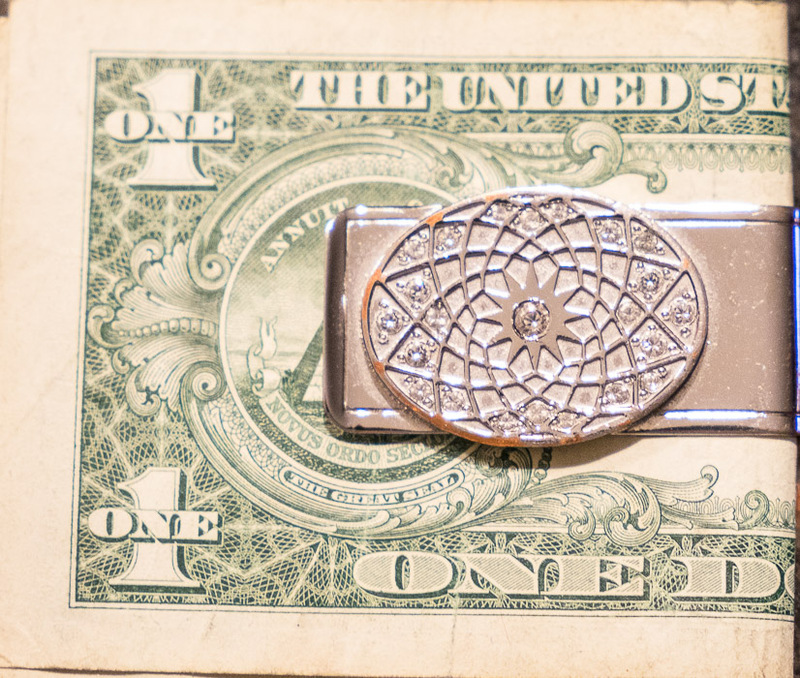 It's embossed on a money-clip (3rd photo below) that I bought in the Capitoline Museum gift shop, and which I love to use whenever the opportunity arises. 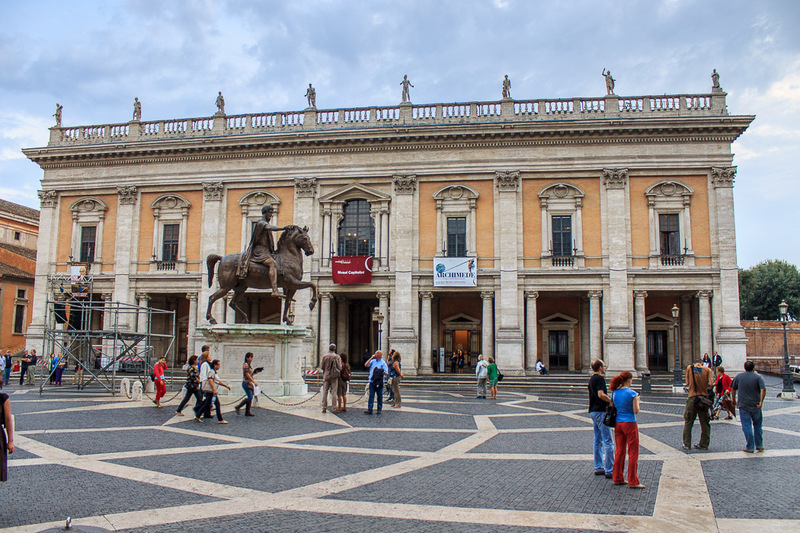 The apparent oval of the paving stones on the Campidoglio is actually slightly egg-shaped to balance the trapezoidal space outlined by the buildings which surround the piazza. 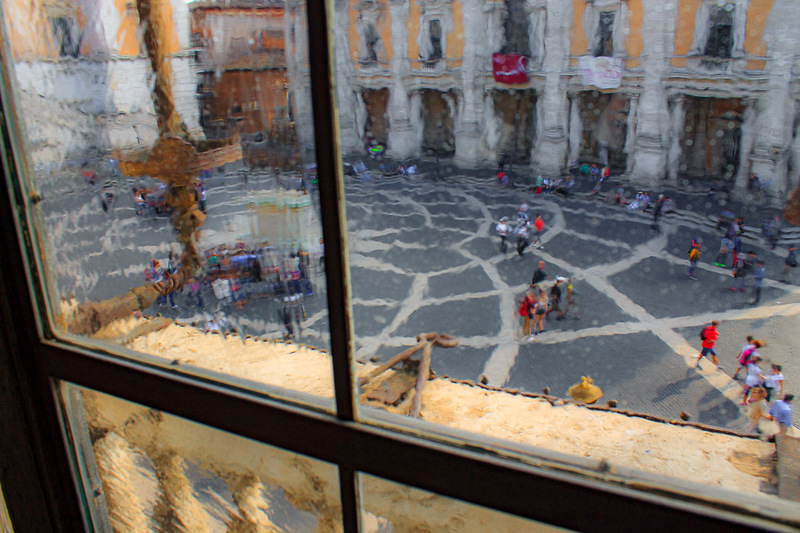 The 4th photo below shows the paving stones of the Campidoglio through the gorgeous old character-filled windows of the Palazzo Nuovo in the Capitoline Museum. 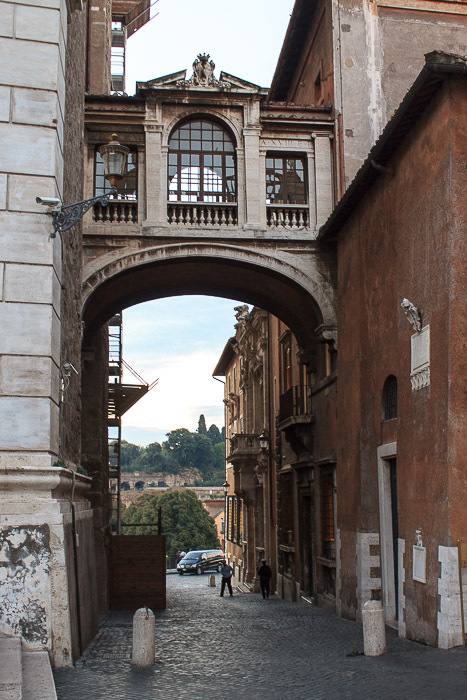 The 3rd photo above and the 5th photo below are views of the stairway (actually more of a ramp since each individual step slopes upward) from Via del Teatro di Marcello up to the Campidoglio. That stairway, called the Cordonata, is often attributed to Micelangelo, but was actually completed and modified by Giacomo Della Porta in 1578. 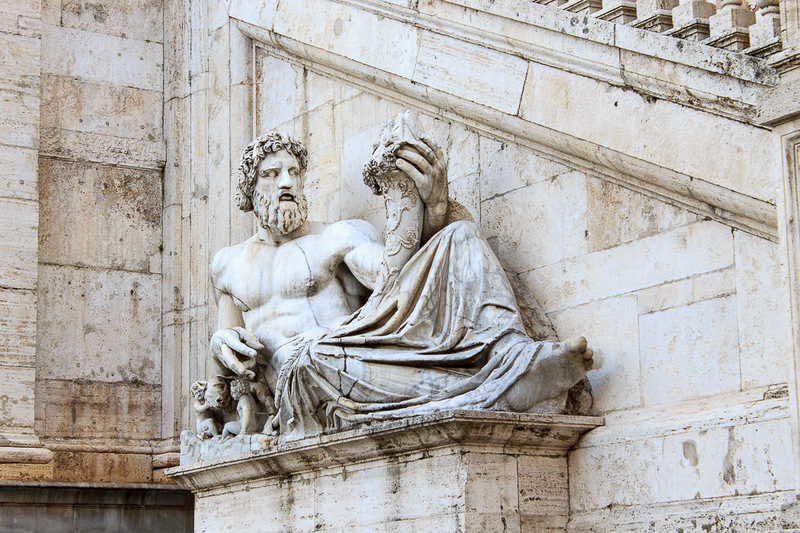 The Campidoglio is loaded with historically significant statues. 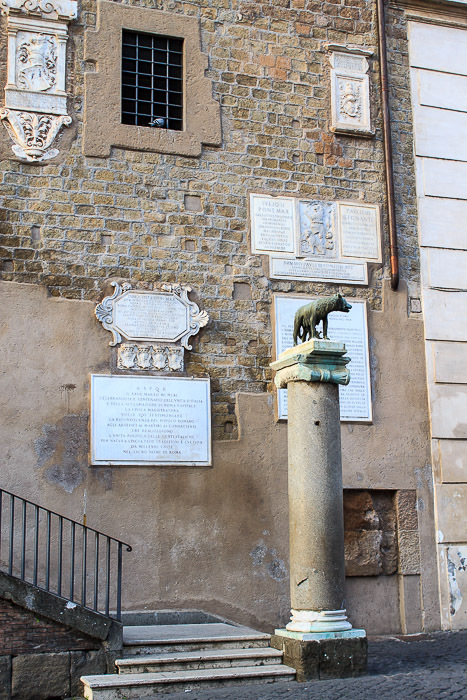 At the bottom of the Cordonata stairway are two Egyptian basalt lion sculptures from the temple to Serapis and Isis in the Campus Martius near Santa Maria sopra Minerva, which have become fountains (1st and 2nd photos below), one on each side of the stairway. Part way up the stairway, on the left, is a statue of Cola di Rienzi (3rd photo below), a 14th century political figure in Rome who claimed himself to be a Tribune and reviver of the ancient Roman Republic, and who ended up being killed near this spot. At the top of the stairway are statues of the Dioscuri (Castor and Pollux) (4th photo below), which are also visible in the 5th photo above. Castor is on the left (5th photo below), and Pollux is on the right (6th photo below). 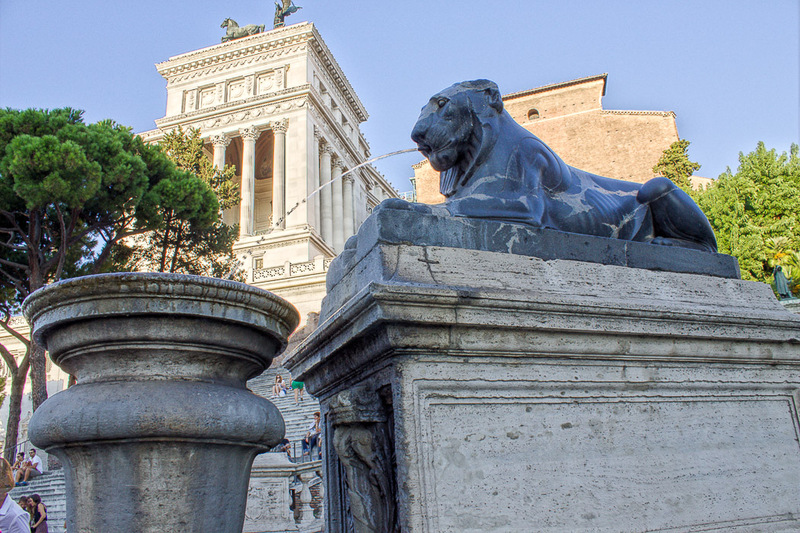 Michelangelo wanted to use the statues which actually now surround the Quirinal Obelisk and the Fountain of Castor and Pollux, but the popes had already confiscated those statues for their palace on the Quirinal Hill. 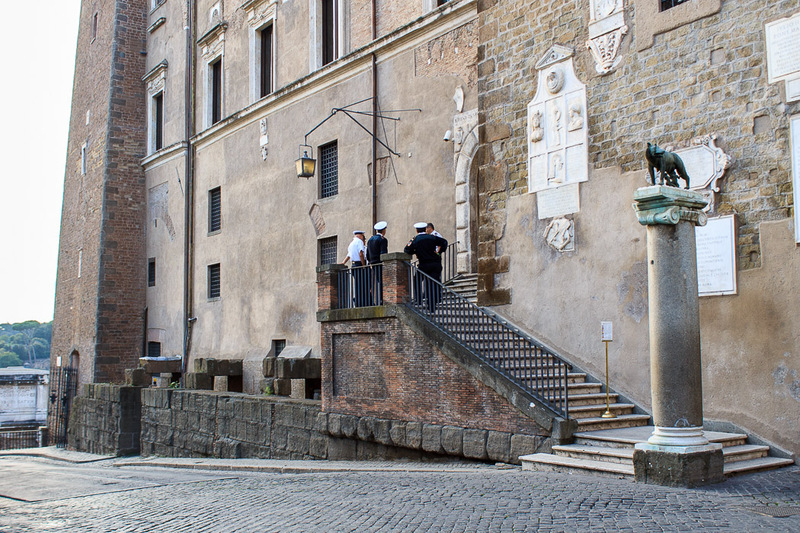 Instead, fragments of statues of Castor and Pollux were found during excavations in the Jewish Ghetto, and were moved to the top of the stairway in 1585. Unfortunately, Castor's original head was never found, so a new one was sculpted in 1582. Pollux's head was badly damaged and a new nose, chin and hair were created at the same time. It is impossible to be sure, but the original faces might have portrayed Augustus' grandsons Gaius (who died at age 24 in 4 AD) and Lucius (who died at age 19 in 2 AD), who were Augustus' intended successors as emperor, and were identified with Castor and Pullux even during their lifetime, and moreso after their deaths. 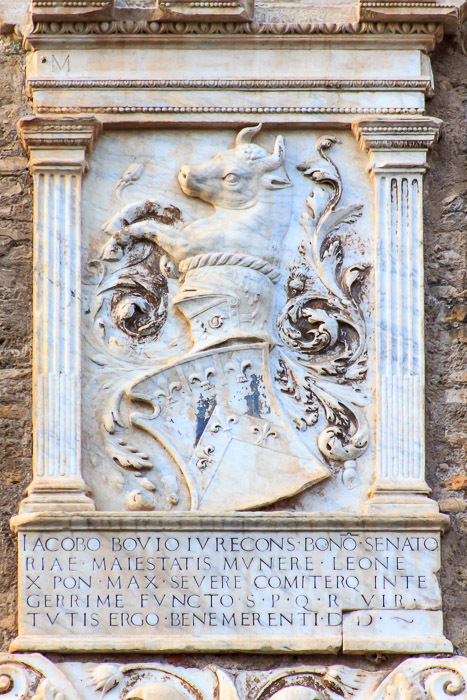 The Dioscuri are particulary appropriate to have been placed here since they are protectors of the city of Rome and insurers of Liberty. 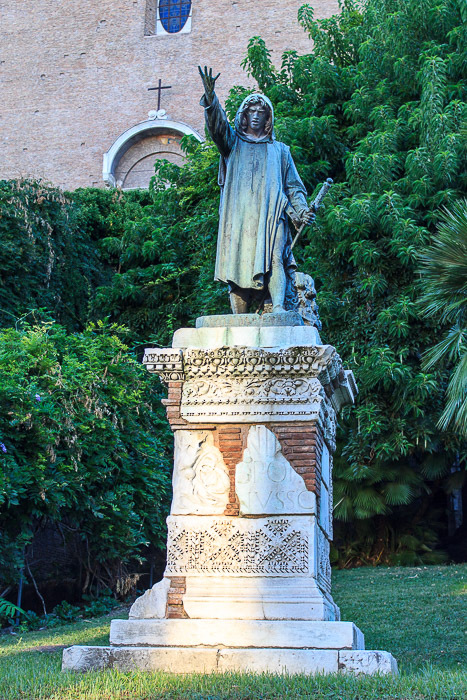 Statue of Cola di Rienzi, a 14th century political figure in Rome who claimed himself to be a Tribune and reviver of the Roman Republic, in the lawn beside the Cordonata, the stairway to the Campidoglio, about half way up. Cola di Rienzi was killed near this spot. The church of Santa Maria in Aracoeli is in the background. 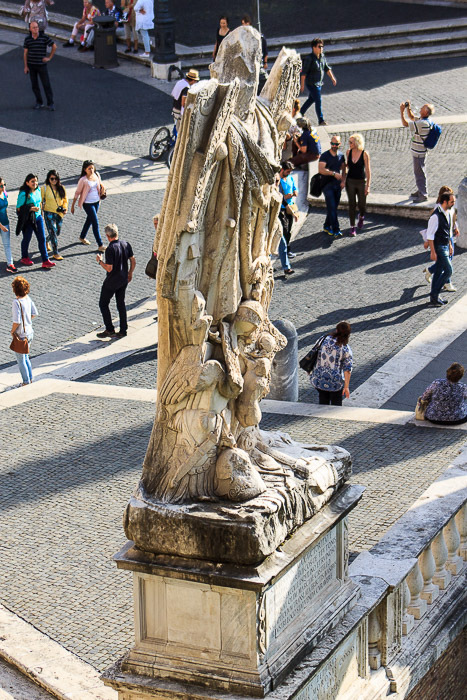 There are several other statues and objects along the edge of the Campidoglio on a balustrade at the top of the Cordonata. 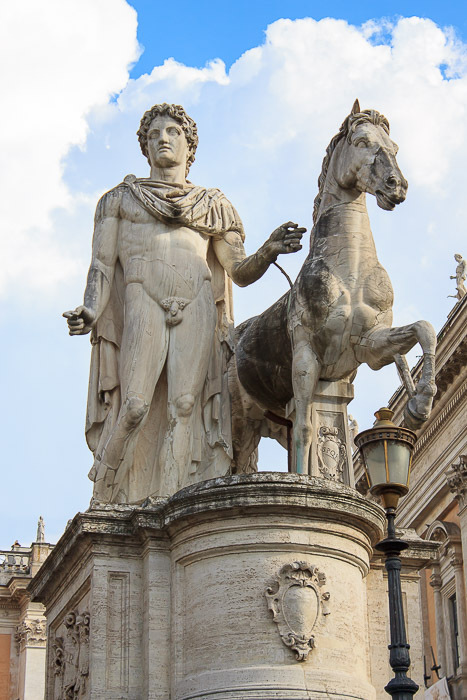 The objects on the left and the right, nearest to Castor and Pollux are the Trophies of Marius. In this context, a 'trophy' is a display of captured enemy arms and armor which was mounted on a wooden framework and carried as part of a triumphal procession. The Trophy of Marius on the left is shown in the 1st and 2nd photos below, and the one on the right in the 3rd and 4th photos below. 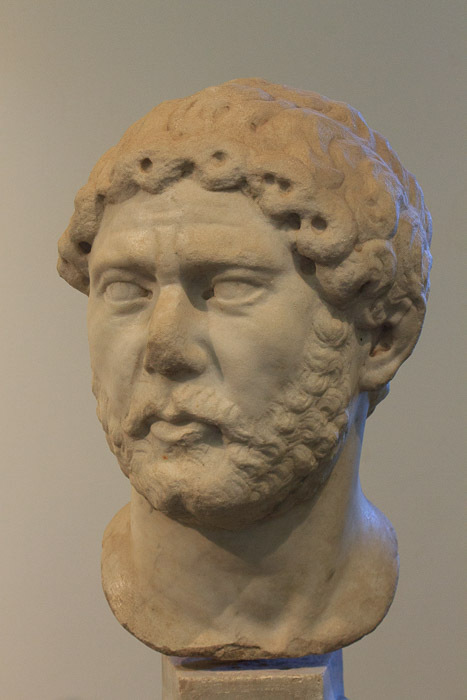 Marius was a late-2nd-century BC general who reformed the armies of the Roman Republic, defeated Teutonic barabaries, won a war in Numidia, won the Social War for Rome, and was consul of the Roman Republic for several terms. He was also Julius Caesar's uncle-in-law. 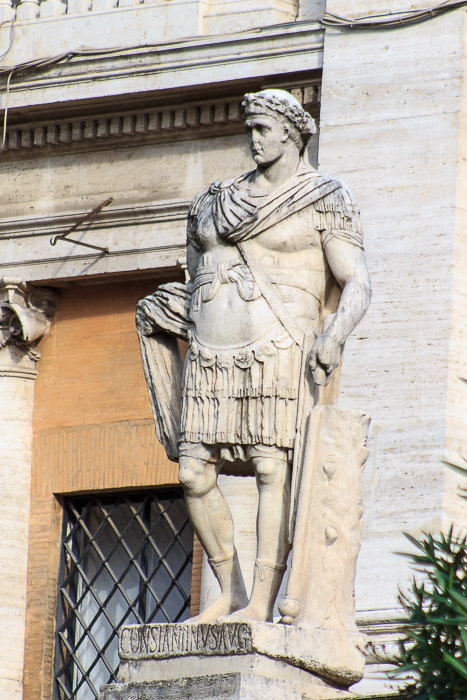 But the association of these trophies with Marius is fiction, because they were actually made for one of the triumphs of the emperor Domitian, and they display the shields and equipment used at that time. 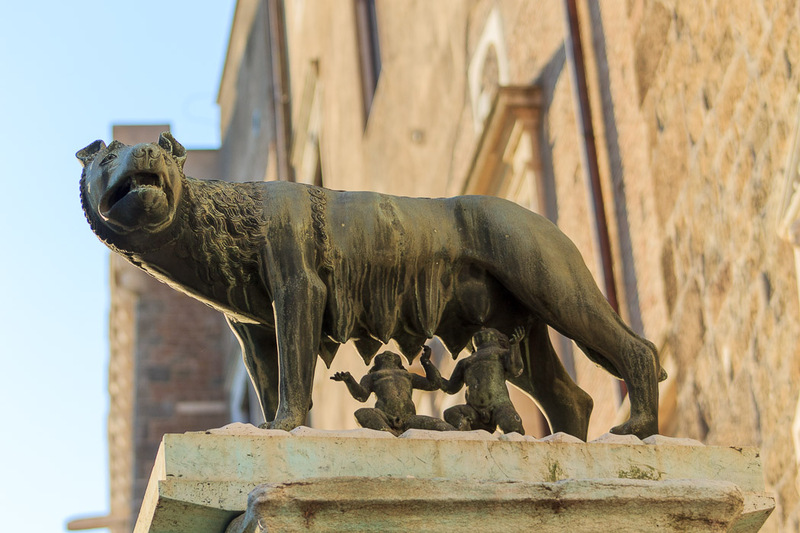 They were reused in the early 3rd century to decorate a fountain also named the Trophies of Marius in an imperial villa built around the time of Emperor Alexander Severus. 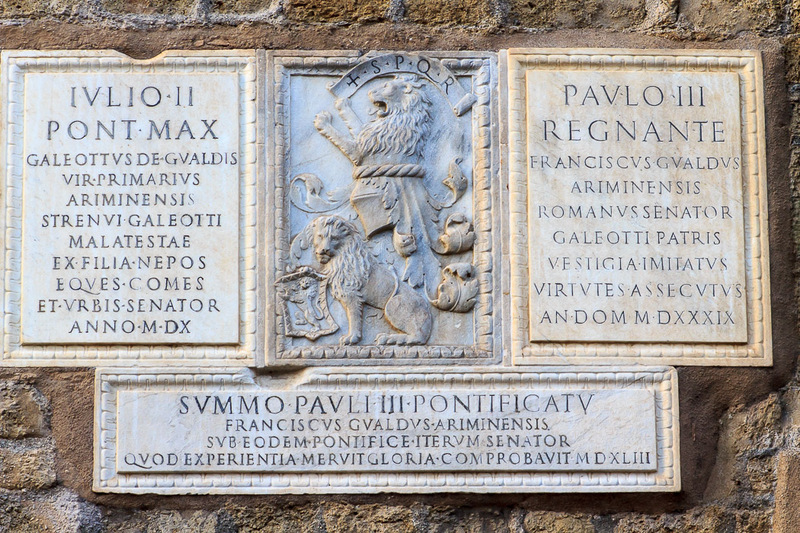 In 1590, the panels were moved from the fountain to the balistrade of the Campidoglio and at that time an inscription on the underside of one was found, telling that the marble had been quarried during the reign of Domitian. Moving outward from the two trophies, we next find a statue of the emperor Constantine the Great on the left (1st and 2nd photos below), and his son, emperor Constantine II on the right (3rd and 4th photos below). 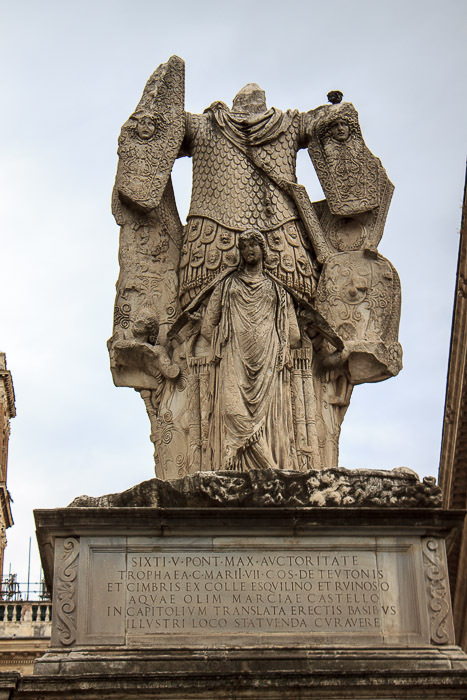 The inscription under the statue of Constantine the Great is Constantinus Aug, indicating he was an Augustus, a senior emperor. 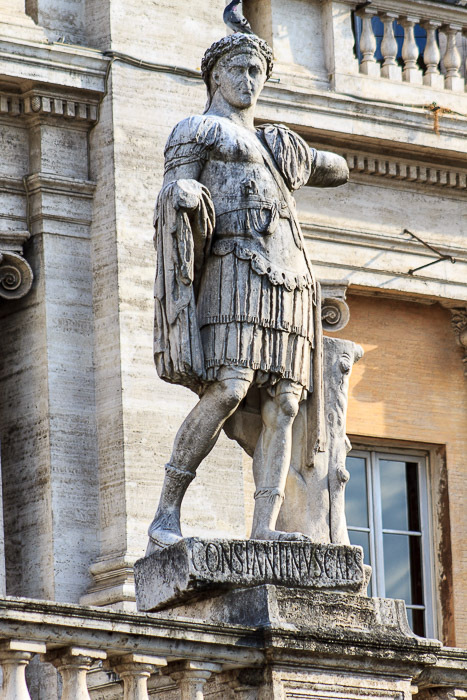 The inscription under the statue of Constantine II is Constantinus Caes, indicating he was a Caesar, a junior emperor. Moving one more step outward, we find mile markers from the Appian Way. 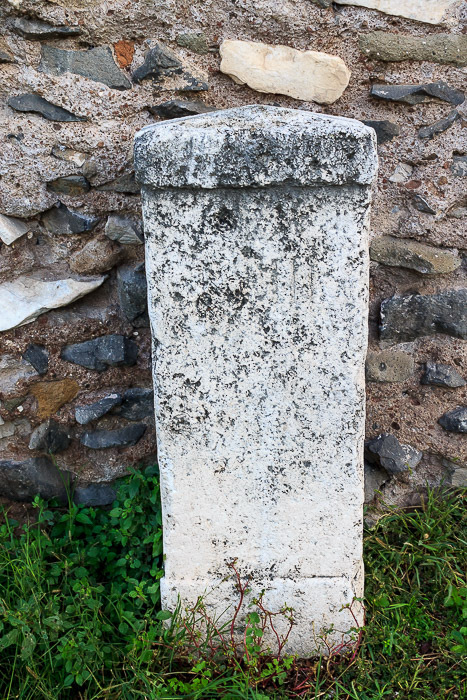 On the left is Mile Marker VII, found in 1848, which is inscribed with the name of Vespasian in 76 AD (1st photo below). 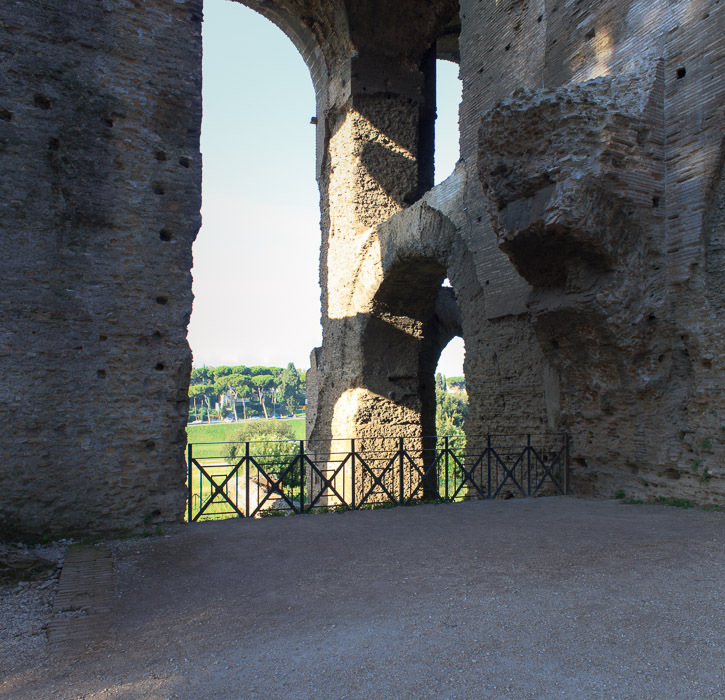 On the right is Mile Marker I of the Appian Way, also inscribed with the name Vespasian, and recording repairs made by Nerva in 97 AD, and added to the balustrade in 1692 (2nd photo below). 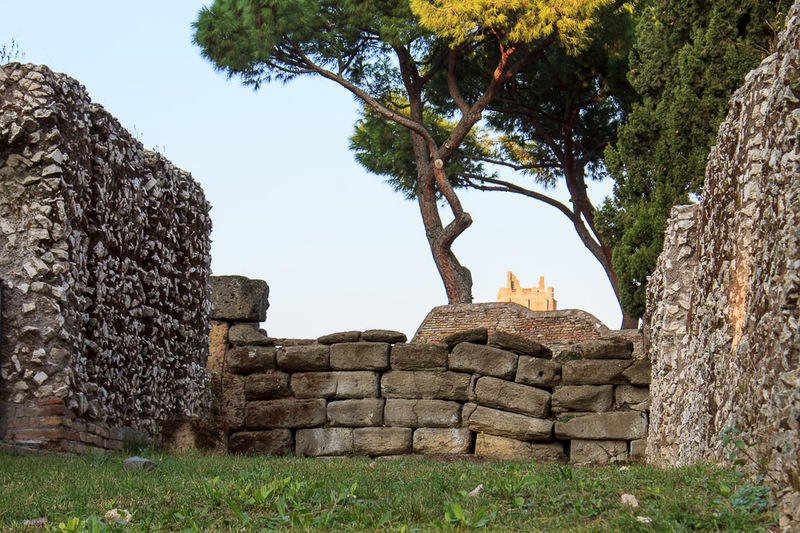 Mile Marker III, still viewable today along the Appian Way, is shown in situ in the 3rd photo below. 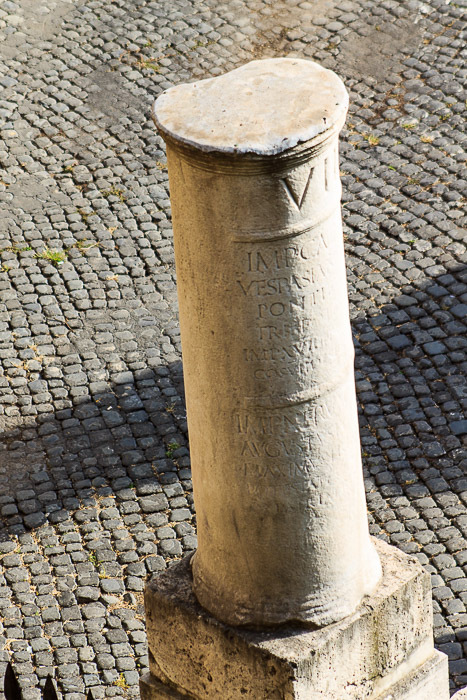 It is very weather-worn, you can barely make out the Roman numeral III right of center near the top. See all Appian Way photos. 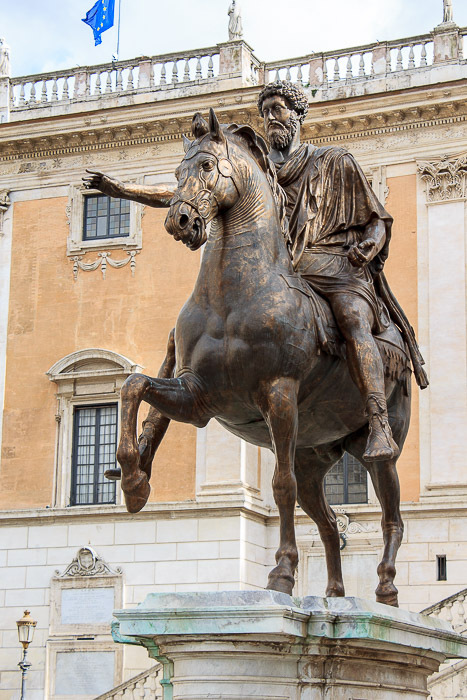 At the center of the Campidoglio is a famous equestrian statue of Marcus Aurelius on a pedestal designed by Michelangelo (1st, 2nd and 3rd photos below). The statue itself is a copy; the original is in the Capitoline Museum, safe from the elements (4th and 5th photos below). 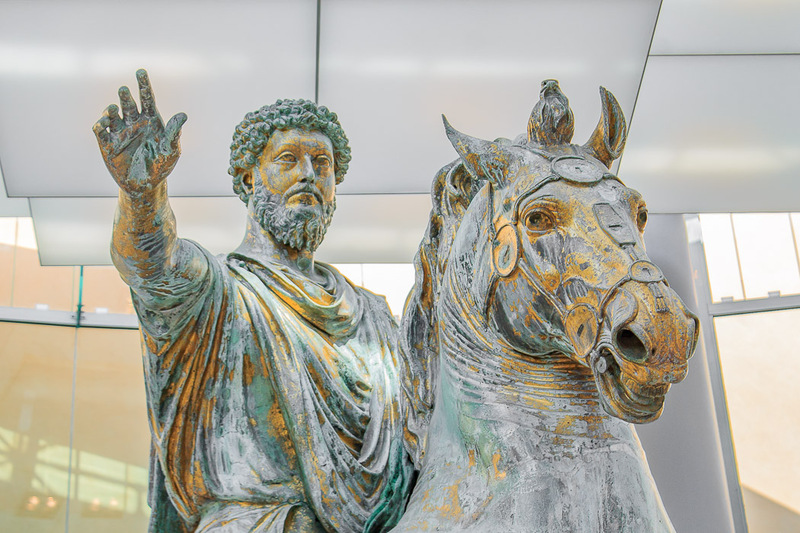 The original was erected in either the Roman Forum near the Antonine Column, or in Piazza Colonna in 175 AD, 5 years before Marcus Aurelius' death. 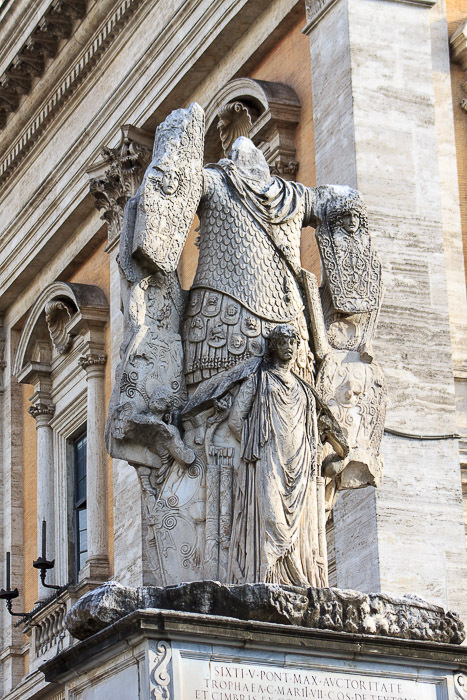 It was not destroyed during the Middle Ages as were most bronze statues because medieval Christians thought it portrayed Constantine the Great, the first Christian emperor. 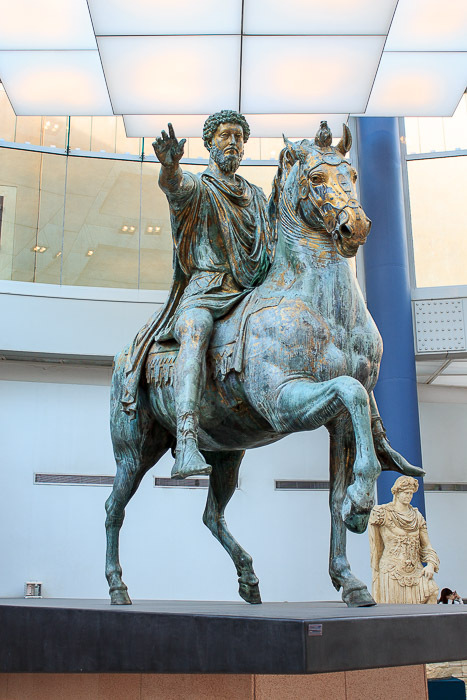 Out of the 22 recorded equestrian statues in the late imperial period, this statue is the only one to have survived. 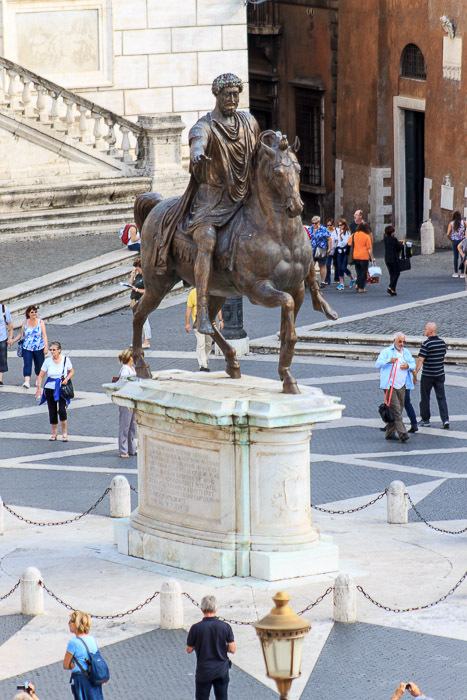 In the 8th century it stood in the Lateran Palace, and in 1538 it was moved to the center of this piazza during Michelangelo's redesign. 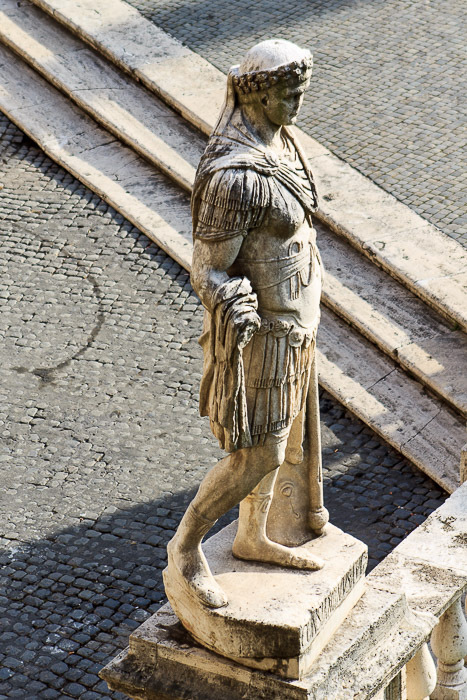 The star-shaped pattern of paving of the Campidoglio emanates from this statue at the center. 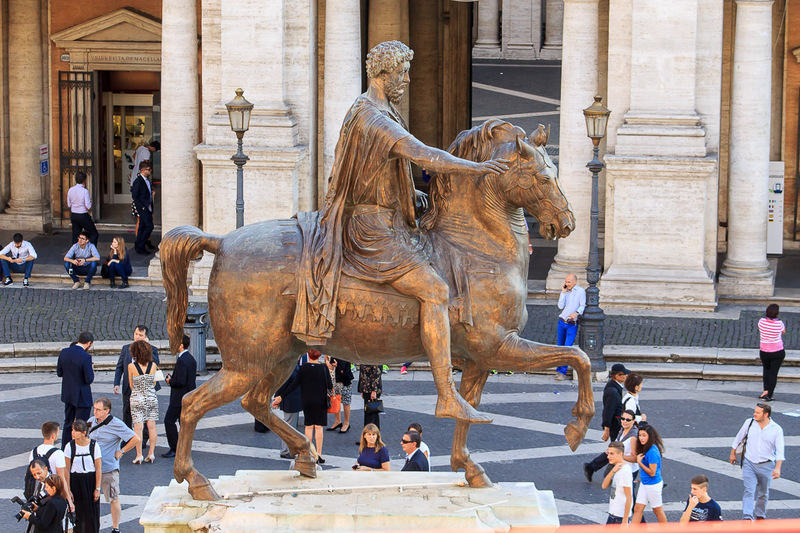 Replica of the statue of Marcus Aurelius at the center of Piazza del Campidoglio (Capitoline Hill). 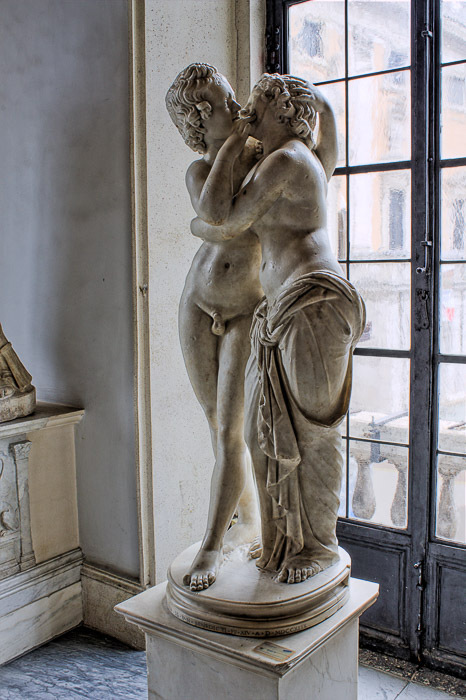 The original is inside the Capitoline Museum. 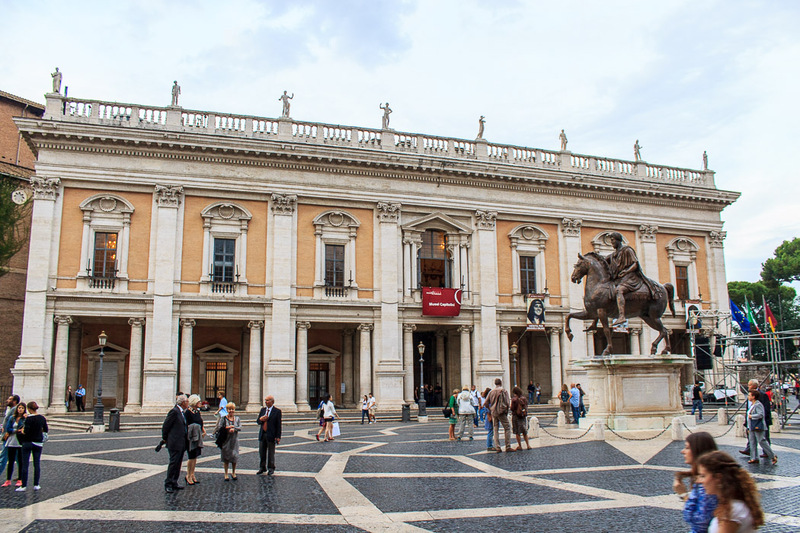 See all Capitoline Museum photos. 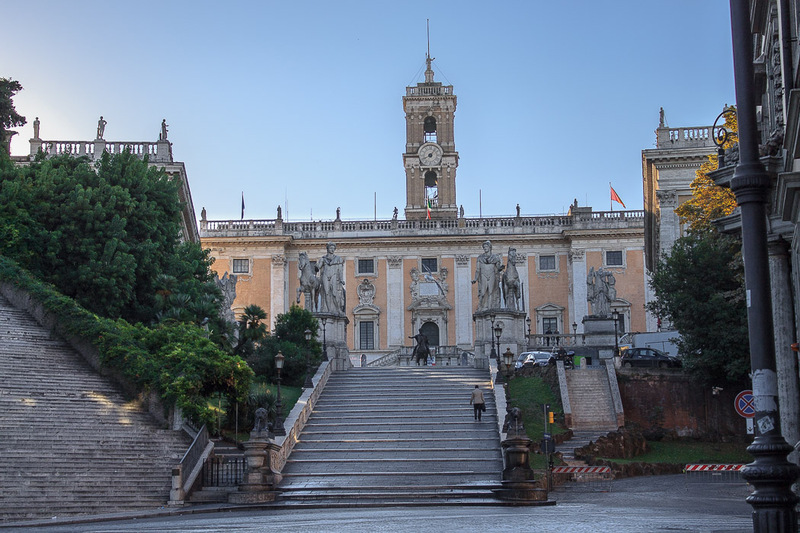 Three buildings line the sides of the Campidoglio other than the side lined by the stairway. 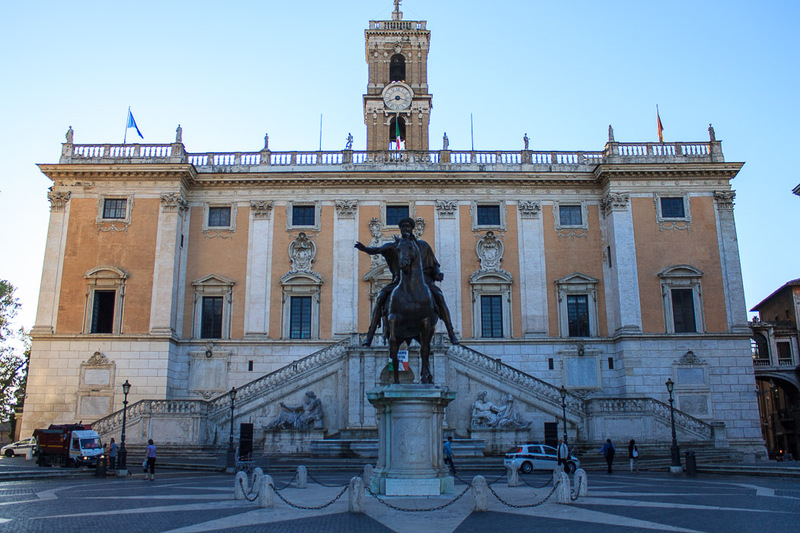 At the opposite end of the piazza from the stairway is the Palazzo Senatorio (1st photo above) located behind the equestrian statue of Marcus Aurelius in that photo. 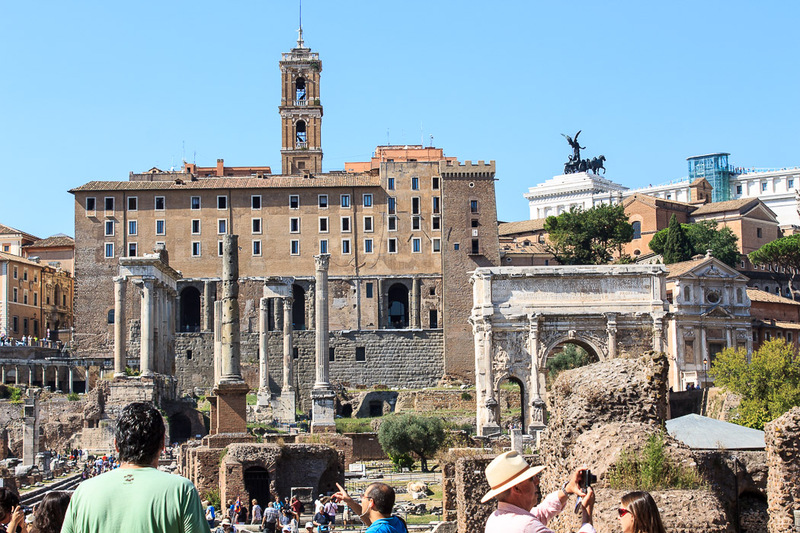 It was built during the 13th and 14th centuries, and it stands atop the ancient Tabularium, which overlooks the Roman Forum and once housed the archives of ancient Rome. 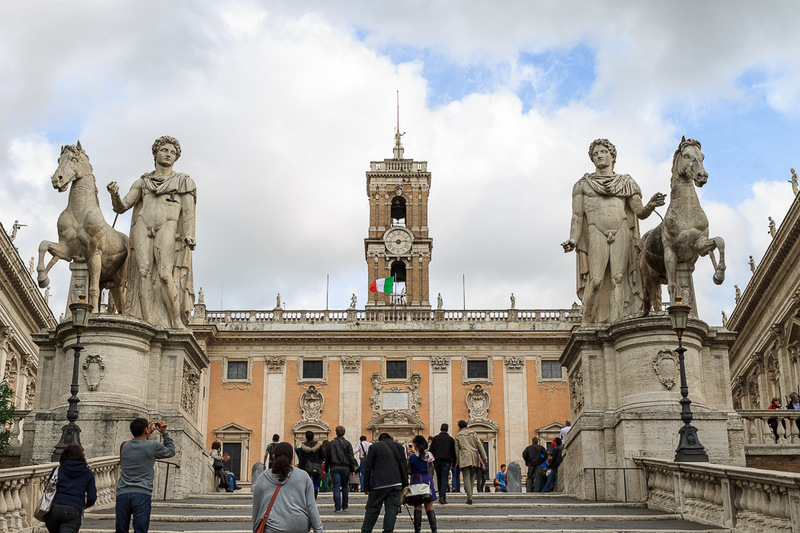 For the first several hundred years, it housed the Senate of Rome, but now it is the city hall of Rome, where today's City Council meets and the mayor has his office. During the 16th century, Michelangelo removed the ancient second floor of the Tabularium and built the upper floors we see today, and he modified the building's facade with a double stairway, discussed in the next paragraph. 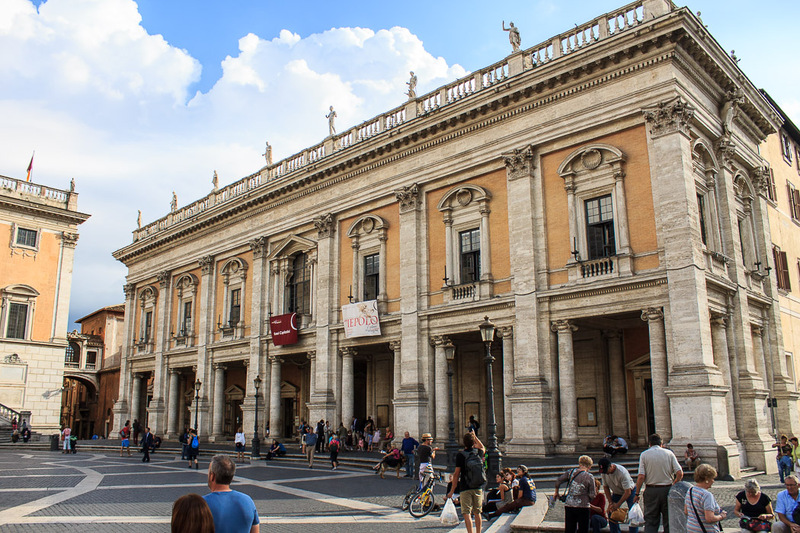 When you face the Palazzo Senatorio, the building on your right is the Palazzo dei Conservatori (2nd and 3rd photos below), which houses the ticket office, the entrance to, and the first half of the exhibits of the spectacular Capitoline Museum. The Palazzo dei Conservatori was built in the 13th century for the local magistrate and renovated by Michelangelo. The pre-existing 80-degree angle between the front face of this building and that of the Palazzo Senatorio, along with his aesthetic feelings against tearing down the structure, caused Michelangelo to design the Palazzo Nuovo at that same angle to the Palazzo Senatorio, making the trapezoidal shape of the piazza. 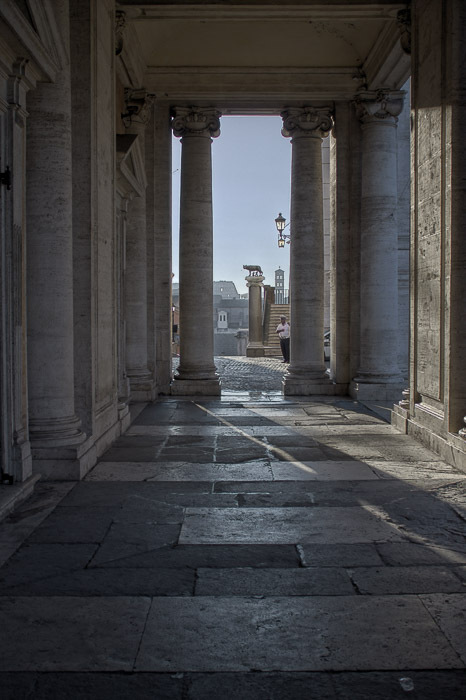 An underground passageway connects that part of the museum to the building on the left side of the piazza, the Palazzo Nuovo, which was constructed from 1603-1654, which Michelangelo designed to balance the piazza and make the space symmetric. The Palazzo Nuovo (4th and 5th photos below) is much smaller than the Palazzo dei Conservatori, but holds superb works of sculpture. Branching off the underground passageway that connects the two pallazi is a hallway which leads to the Tabularium, which is behind and under the Palazzo Senatorio and overlooks the Roman Forum. If you're lucky and the afternoon light is right (1st photo below) or the window is opened during the evening (2nd photo below), the right-most window of the 2nd floor of the Palazzo Nuovo will show you the back side of one of my favorite works of art, showing Cupid and Psyche in their romantic embrace (3rd photo below). 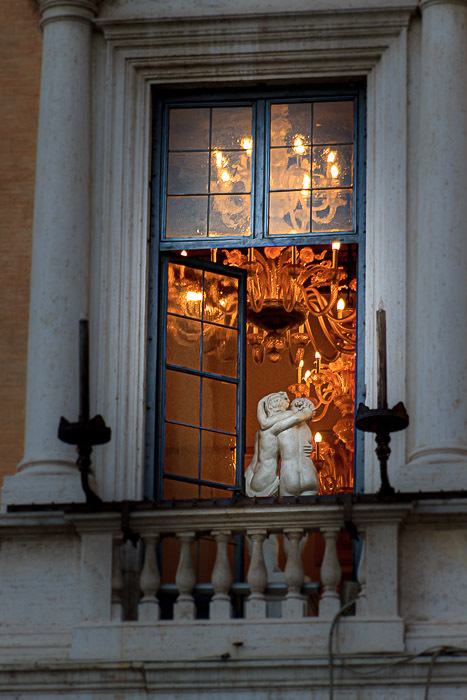 Focusing back on the Palazzo Senatorio, the facade of the building features a double stairway, shown in the 1st photo below. Under the left stairway is the sculpted personification of "The Nile" river god (2nd and 3rd photos below), leaning on a Sphinx. 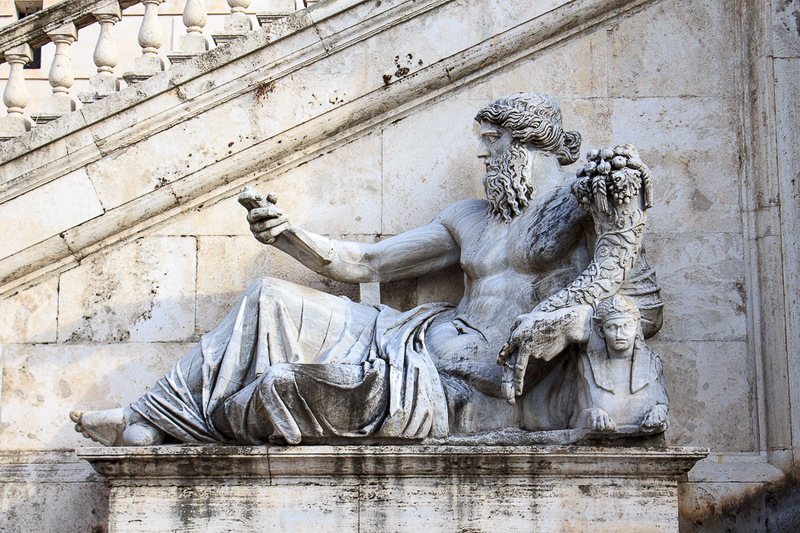 This is a typical ancient statue of a river god, as they usually hold a cornucopia and lay on couches. 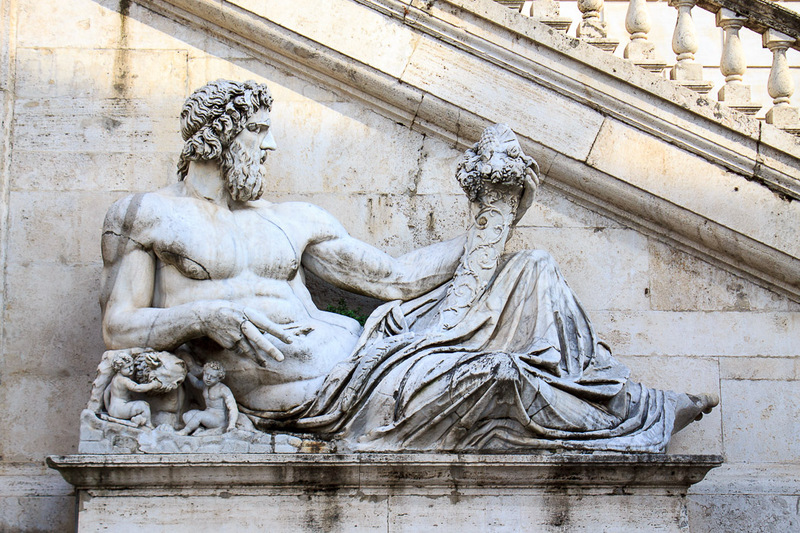 Under the right stairway is a sculpted personification of "The Tiber" river god (1st, 2nd, 3rd and 4th photos below), leaning on the She-Wolf suckling the twins Romulus and Remus. 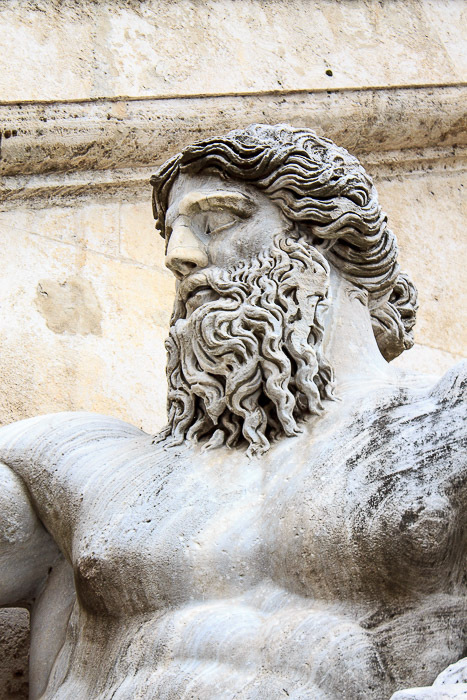 This was originally a portrayal of the Tigris river god, but was changed to the Tiber when the She-Wolf was added. 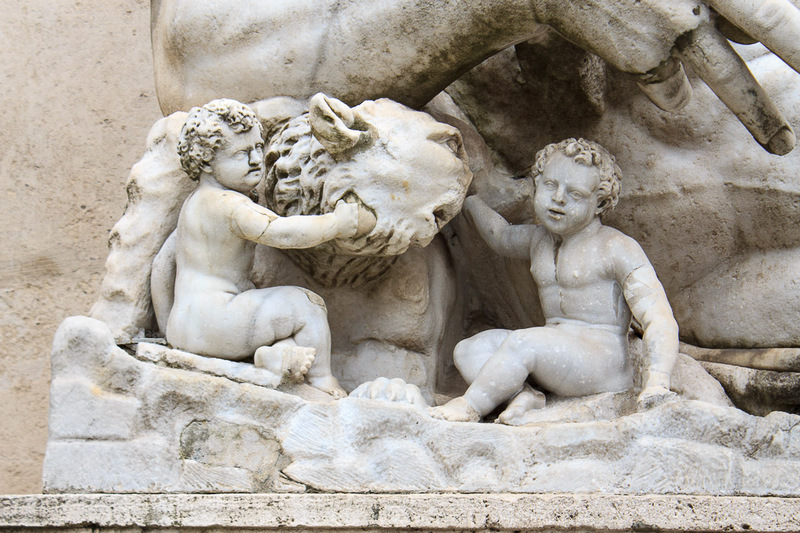 The Nile and Tigris river gods were found in Palazzo Rospigliosi, across the street and just a little bit south from the Quirinal Obelisk. 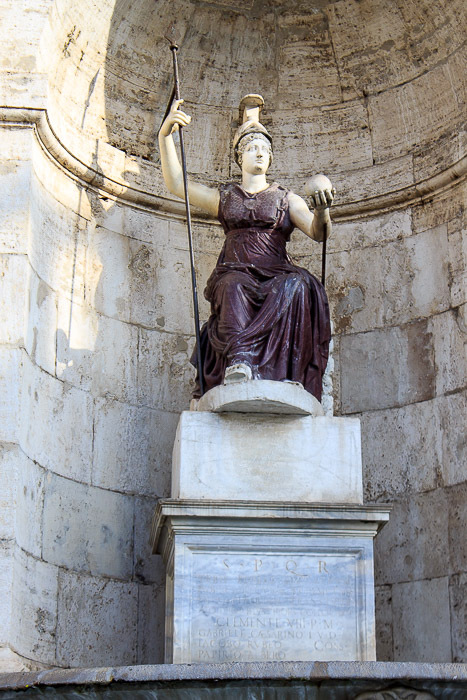 In the center is a statue of Roma (1st photo below), the personification of Rome, a goddess derived from Minerva, rather than the statue of Jupiter that Michelangelo wanted put there. 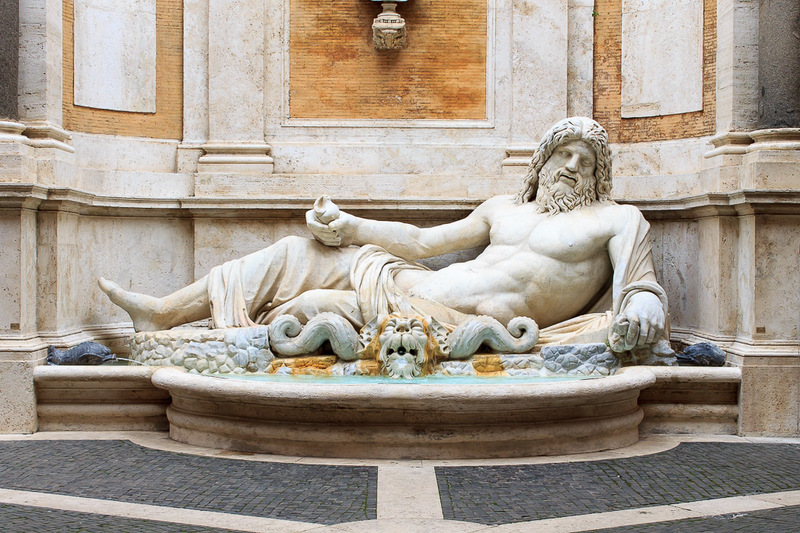 Beneath the statue of Roma is a large pool called the Fontana del Campidoglio (Fountain of the Campidoglio). 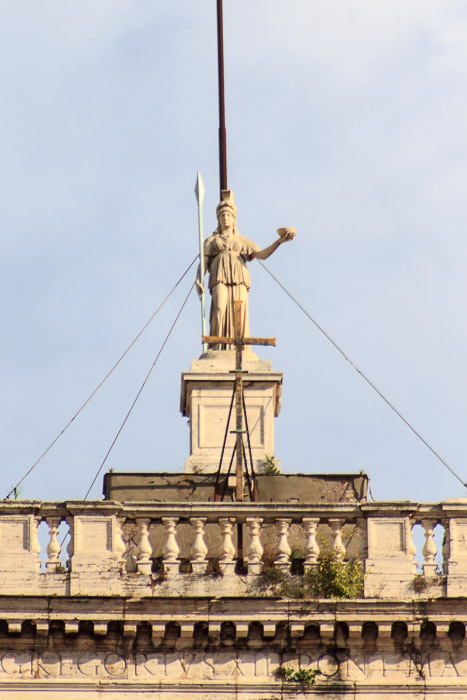 Roma also appears on top of the bell tower of the Palazzo Senatorio (2nd, 3rd and 4th photos below). 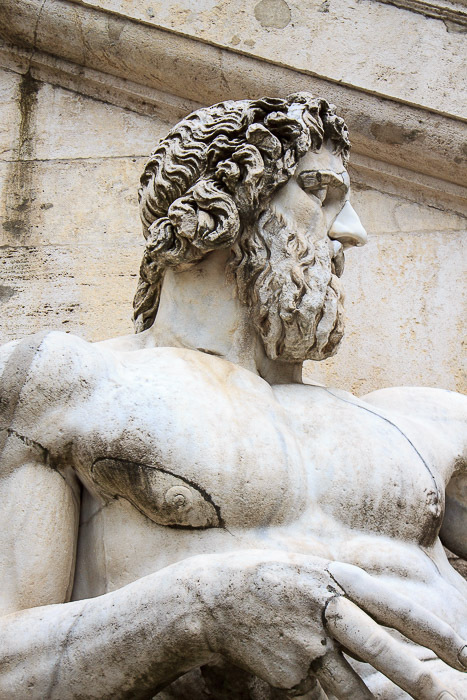 The colossal statue of the river god Marforio, from the first or second century AD, was originally located beside the Mamertine Prison, situated behind a great round stone basin which was moved in 1818 into the Fountain of Castor and Pollux. 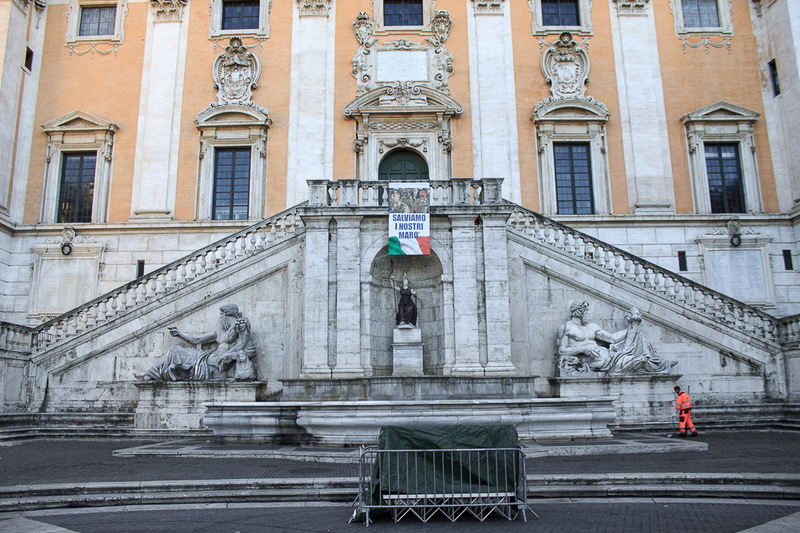 Marforio was moved in 1595 from that location at the foot of the hill onto the Campidoglio, probably to control the satires which were hung on it since it was one of the Talking Statues of Rome. People posted questions one day on the statue named Pasquino, and anonymous subversive answers would appear on Marforio the next day. 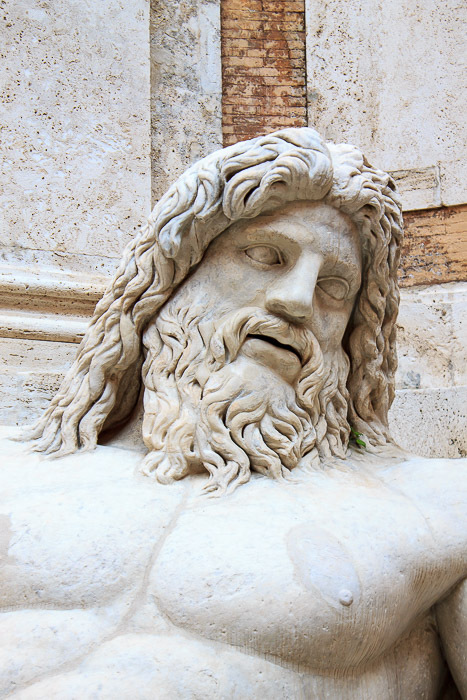 The statue was moved into a beautiful courtyard in the ground floor of the Palazzo Nuovo in 1679, and can be viewed as part of your tour of the Capitoline Museum, or in the photos below. 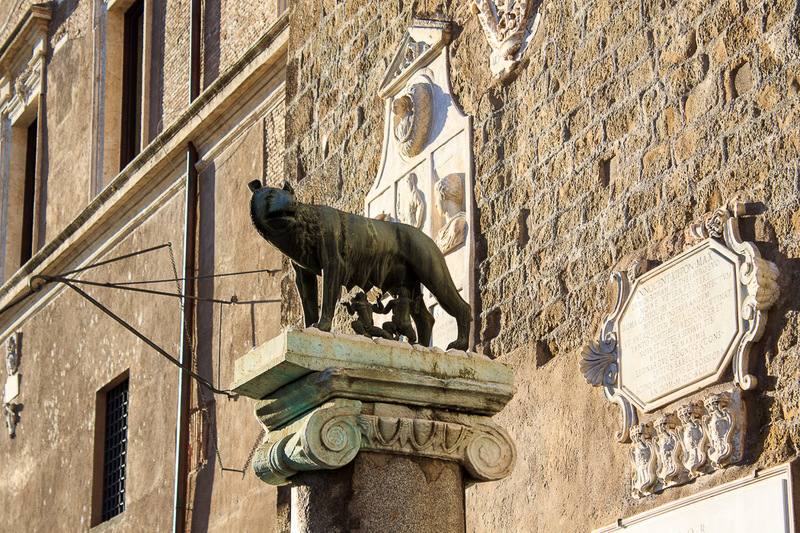 The left side of the Palazzo Senatorio has a column with a Romulus and Remus She-Wolf at the top, shown in the photos below. Sorry for the excess of photos, but I really like this particular She-Wolf. 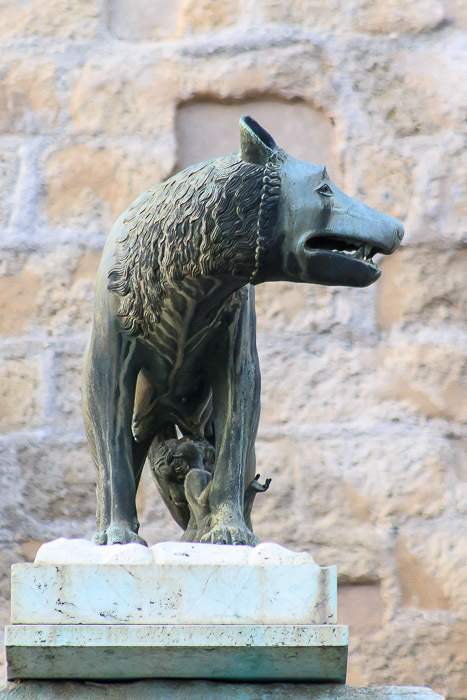 Another She-Wolf is made from bushes, this one tucked behind the left side of the Palazzo Senatorio, and located in front of an unidentified ancient-looking wall behind it (1st and 2nd photos below). More of that wall is shown in the 3rd and 4th photos below. 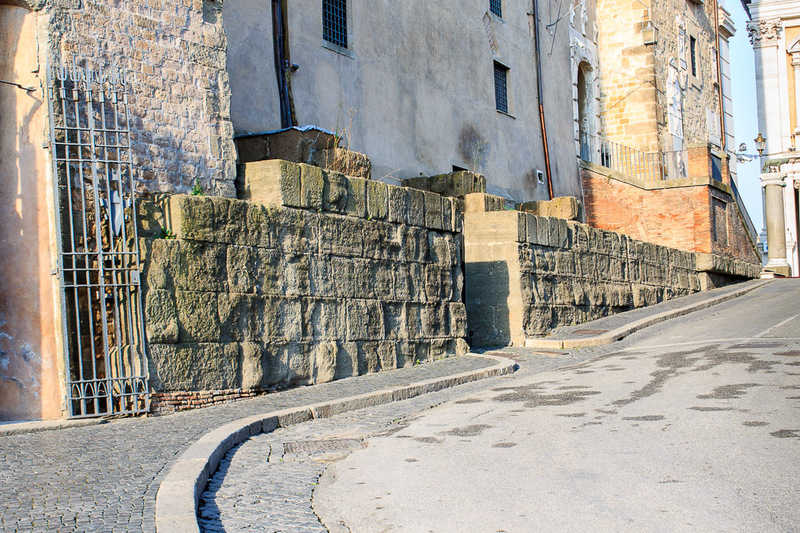 A similar looking wall runs along bottom of the northern (left) edge of the Palazzo Senatorio (5th photo below). 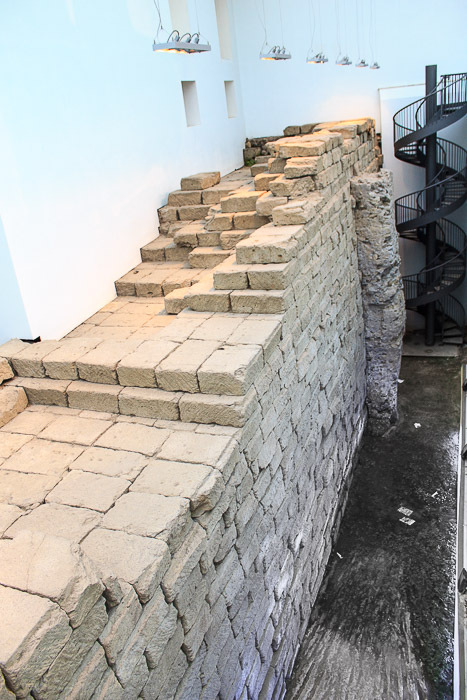 Perhaps that wall is part of the original Tabularium? 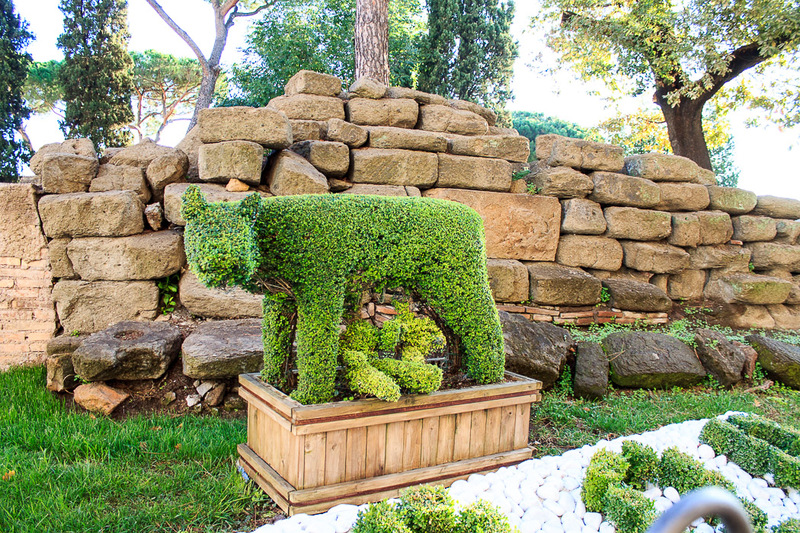 A she-wolf made of bushes at the edge of the Campidoglio, with an unidentified ancient-looking wall behind it. 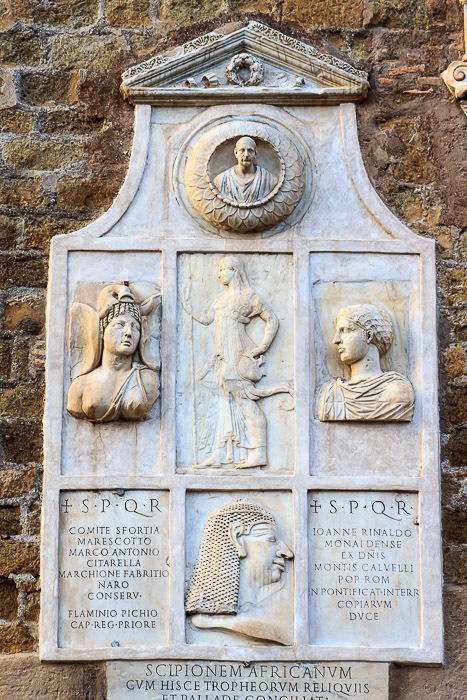 Several historical plaques can be seen on the left side of the Palazzo Senatorio, as shown in the photos below. 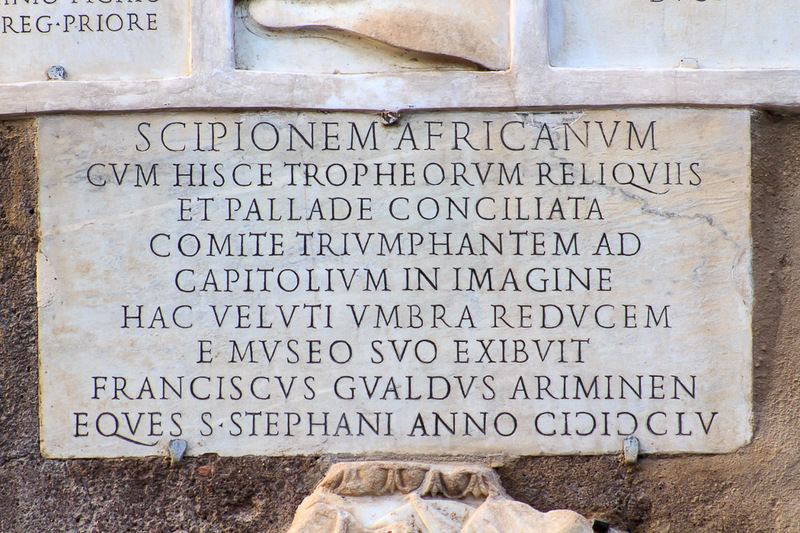 The 1st and 2nd photos are from a monument to Scipio Africanus, the general who saved Rome from ruin when Hannibal invaded with his elephants. The 3rd photo is a dedication to Pope Leo X. 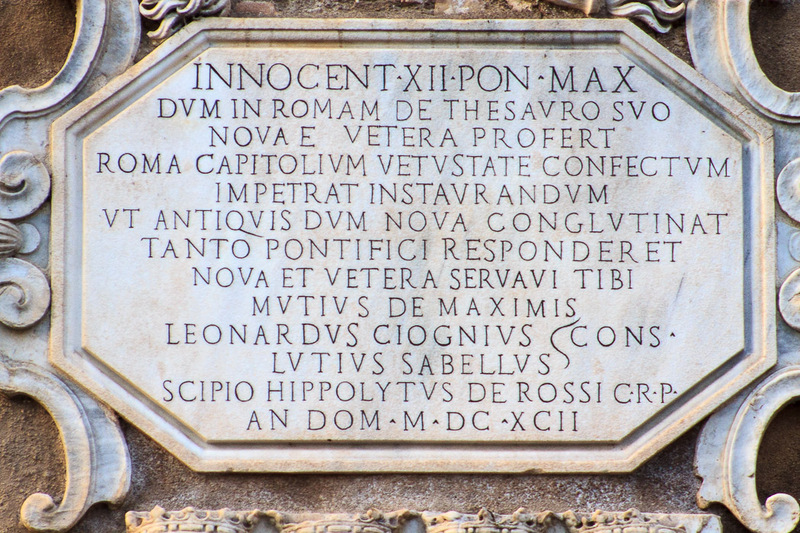 The 4th is to Pope Innocent XII. The 5th is to Pope Julius II and Pope Paul III, and the 6th is to World War II heroes of Italy. 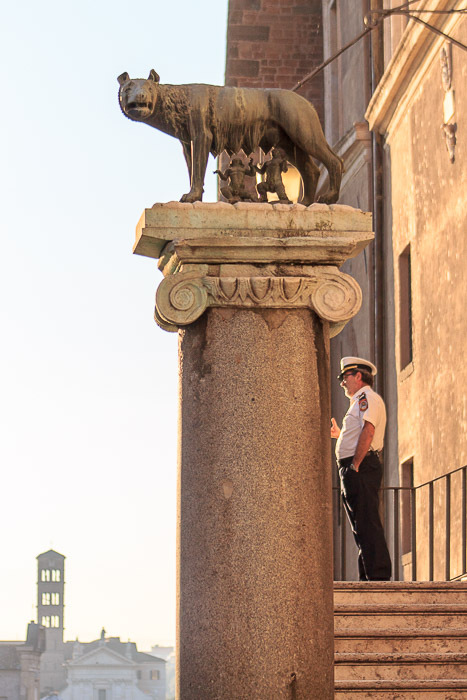 A walk around the rest of the top of the Capitoline Hill shows a few more sights of interest. 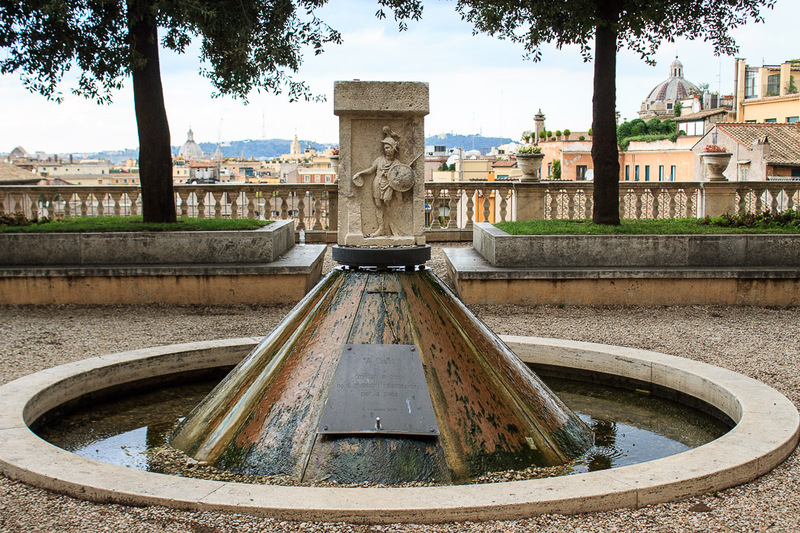 I suggest walking around to the right side of the Palazzo dei Conservatori where a road leads to the Piazzale Caffarelli with its unusual fountain (1st photo below) and its spectacular view of the Theatre of Marcellus (2nd photo below). 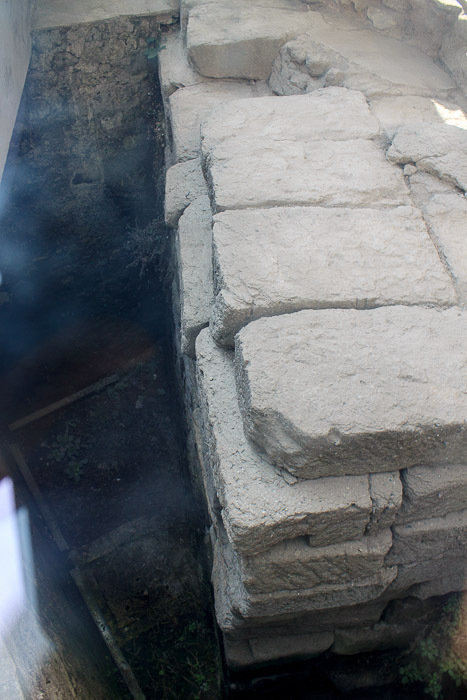 Continue walking around the buildings, and on the edge of the building on the other side you'll come to the glass enclosure affording a view into the foundation of the Temple of Jupiter (3rd photo below). 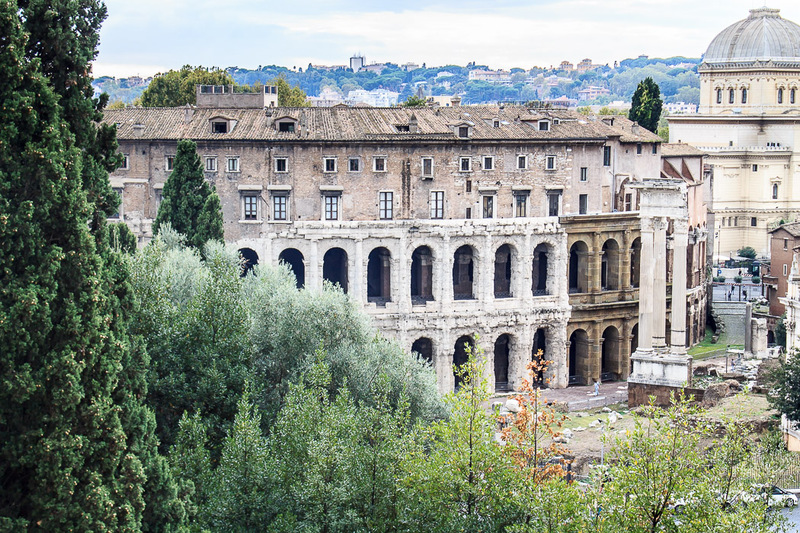 Continue walking around the building and you'll come to a nice view of the Roman Forum from the back of the southern side of the Palazzo Senatorio (4th photo below). 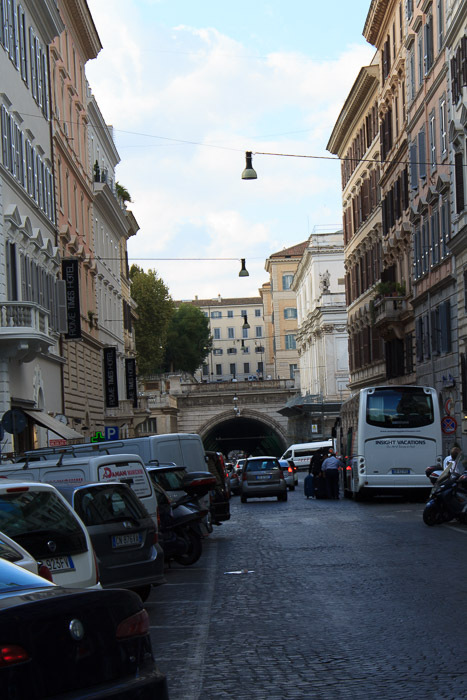 Walk back out to the front of the Palazzo Senatorio and you'll pass under the bridge in the 5th photo below. 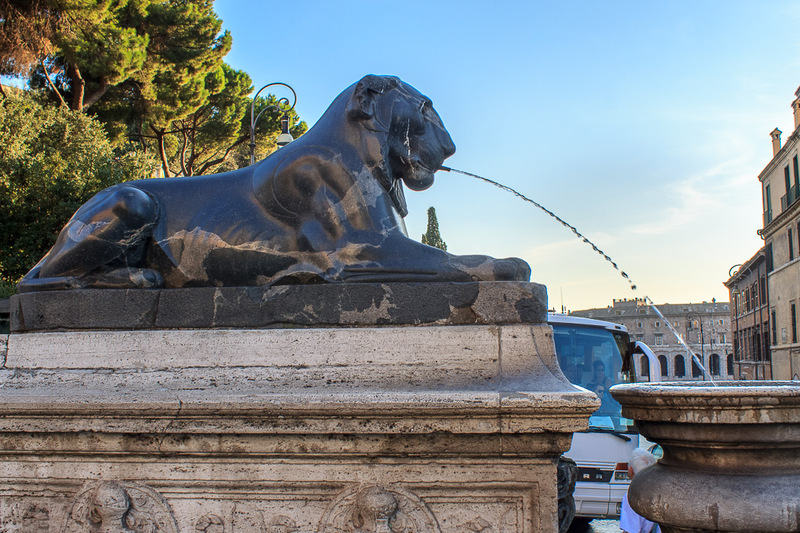 See all Fountain in Piazzale Caffarelli photos. See all Theatre of Marcellus photos. 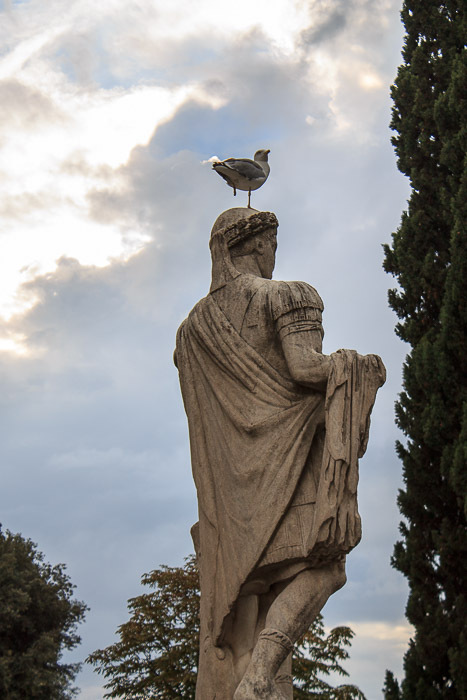 See all Roman Forum photos. 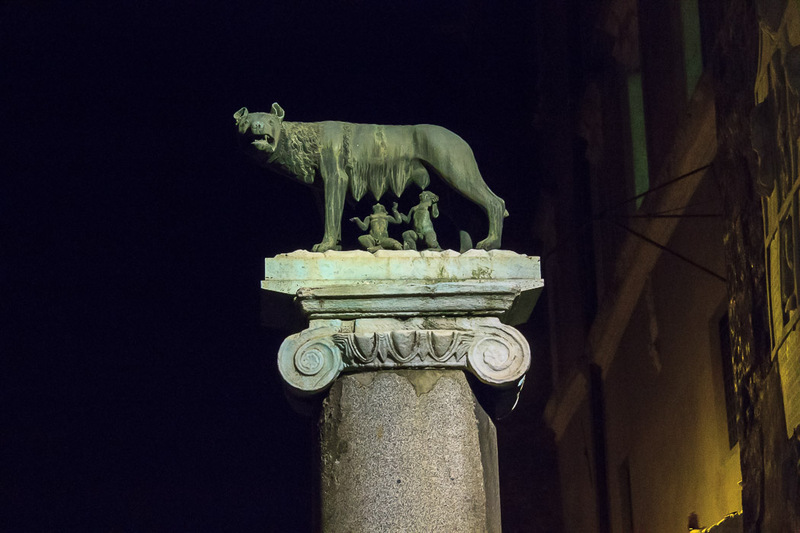 The Capitoline Hill is an excellent place to see the Roman Forum for free, especially at night. 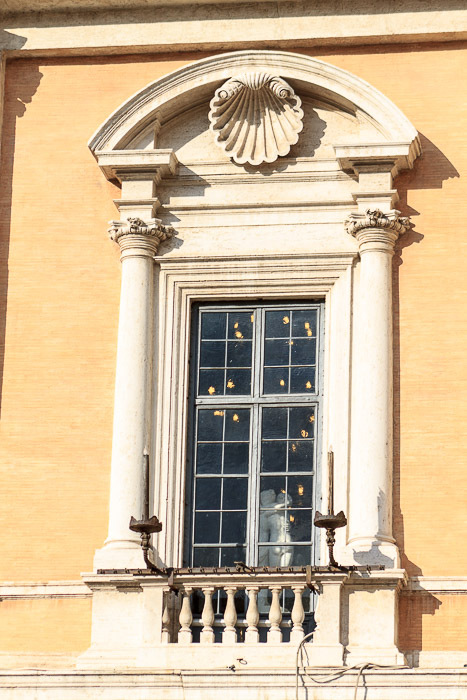 On the left (northern) and right (southern) side of the Palazzo Senatorio are porches from which you can view the Roman Forum. 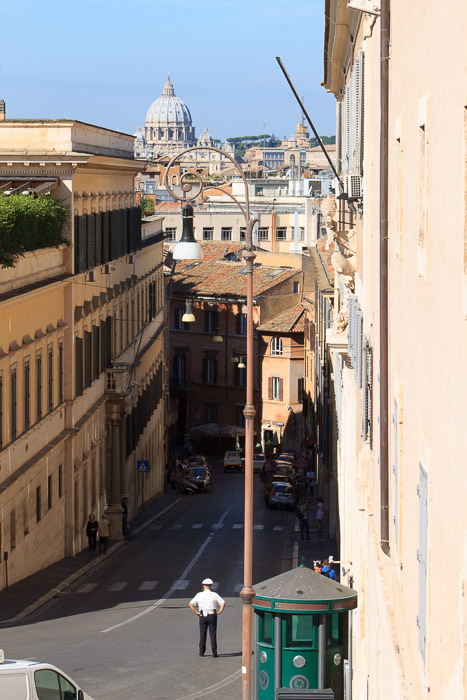 These porches (along with the Capitoline Hill) can be reached from Via dei Fori Imperiali via the small road between Caesar's Forum and the Victor Emmanuel Monument, and from Via del Teatro di Marcello on Vico Jugario which turns into Via de Consolazione, as well as from the Cordonata ramp from Via del Teatro di Marcello. The two photos below were taken from the porch on the left (northern) side, which I find provides a more pleasing view than those from the right (southern) side (4th photo above). 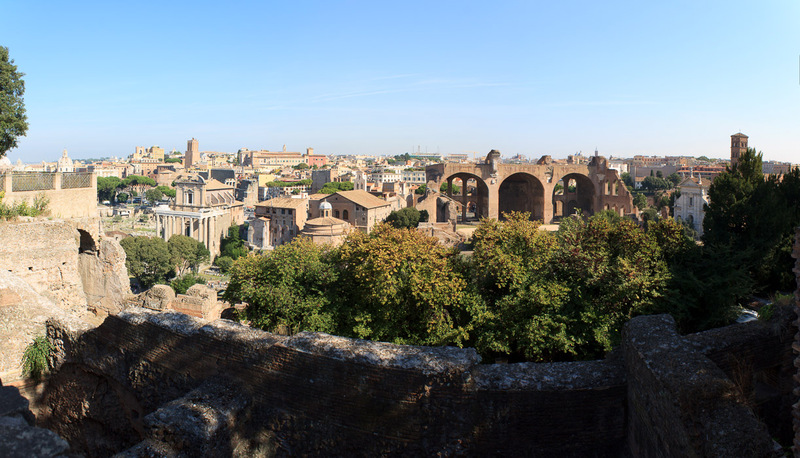 The two panoramas below were taken from the Capitoline Hill. 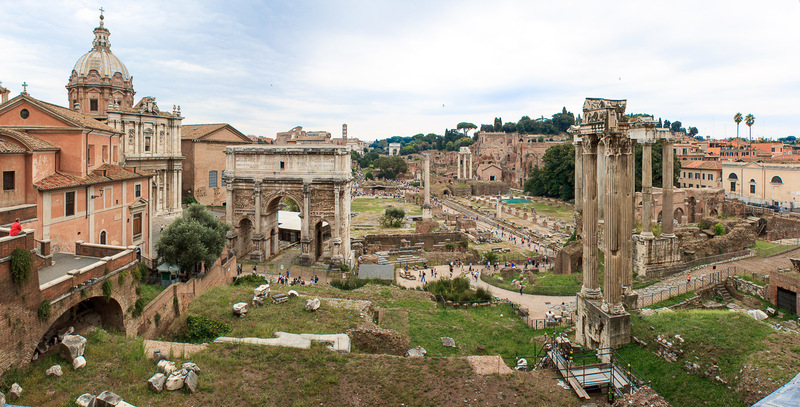 The upper one is of the Roman Forum, taken from inside the Tabularium while visiting the Capitoline Museum. The lower one is of the entire Campus Martius area, taken from the top of the Victor Emmanuel Monument. The Esquiline Hill is the highest and largest of the Seven Hills of Rome but is only obvious to see from a few points since it is so large. The entire hill runs from the Colosseum to Santa Maria Maggiore and east to beyond Porta Maggiore. This encompasses the Monti and Esquiline neighborhoods of Rome. The Esquiline Hill has three three summits. The southern summit is east-northeast of the Colosseum and is mainly filled by the public park named Parco Oppio since this summit is called the Oppian Hill. This is where my photos of the Esquiline Hill were taken. 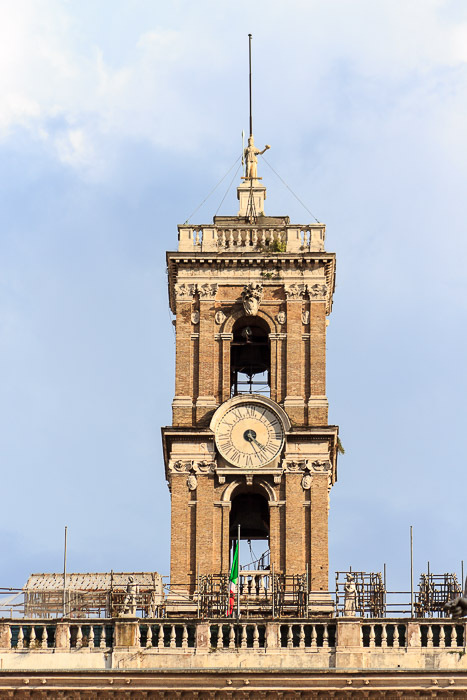 The northern summit is called the Cispian Hill, upon which Santa Maria Maggiore stands. The western summit, called the Fagutal Hill, is the part of the Esquiline Hill dominated by St. Peter in Chains. 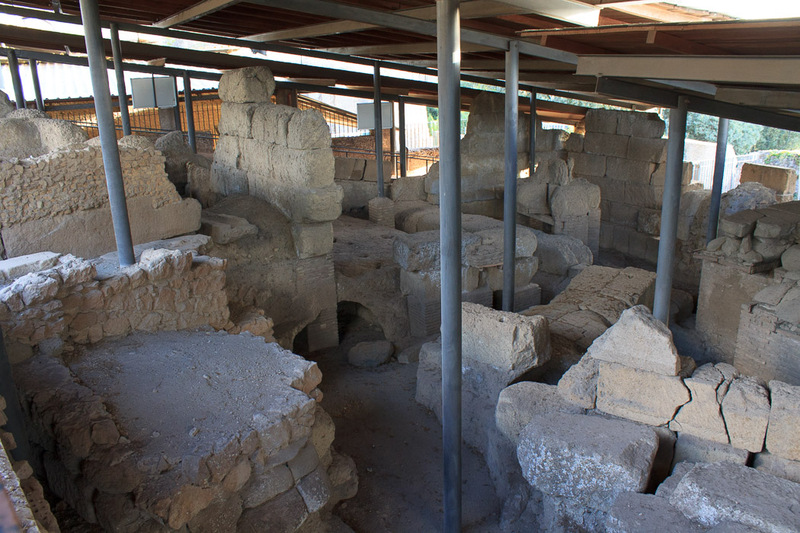 Sights on the Oppian peak of the Esquiline Hill include remains of the Baths of Trajan (1st photo below), and the Domus Aurae of Nero (currently closed to the public, 2013). Other nearby sights are the Colosseum, the Ludus Magnus, and San Clemente. 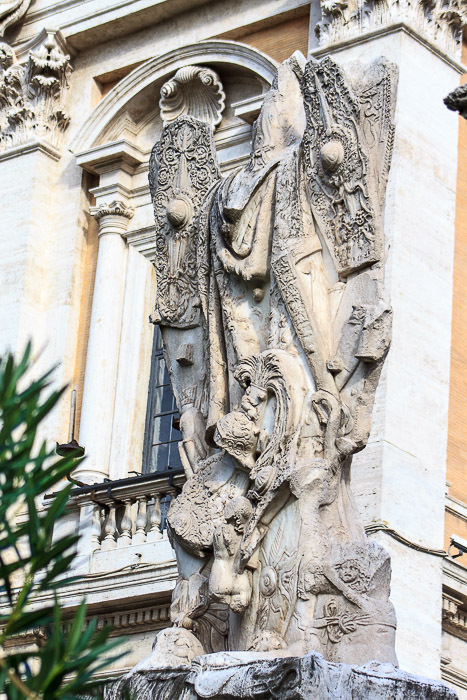 As you head north away from the Oppian summit, sights include St. Peter in Chains, Santa Maria Maggiore, Santa Prassede and many of the sights on my Southeastern Sights Walking Tour. See all Esquiline Hill photos. The spot that I selected for my panorama from the Esquiline Hill, shown below, is facing south from the Oppian Summit. 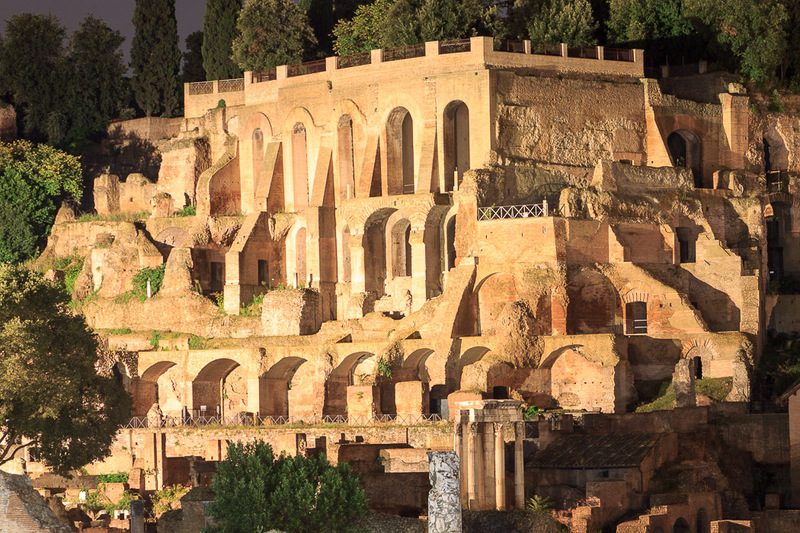 Located between the eastern half of the Roman Forum and the Circus Maximus, the Palatine Hill is one of the two currently non-populated hills of the Seven Hills of Rome, along with the Capitoline Hill. 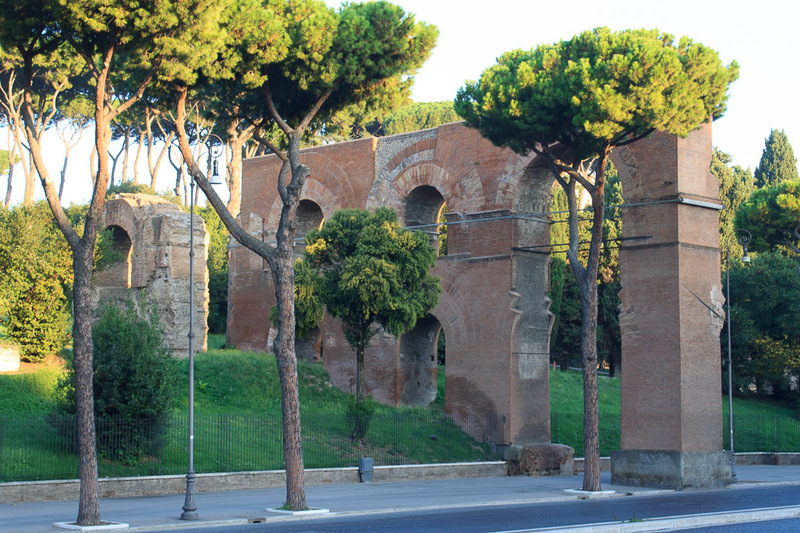 The Palatine was the hill that Romulus setup his home upon in the creation legend of Rome, and it is where the Roman Emperors had their immense palaces. 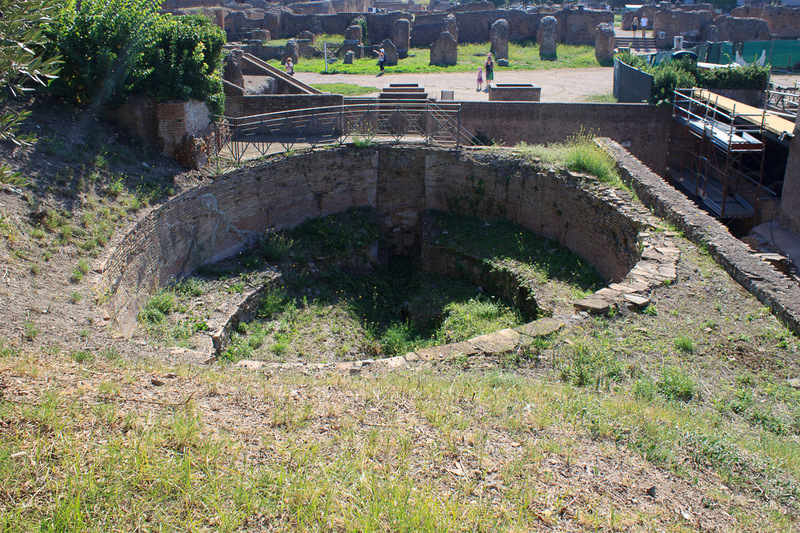 Today, very little remains of many of the buildings once on the Palatine Hill. In my opinion, the signage is poor throughout the site and recommended route is unmarked, making it a rather confused mess that is hard to make sense out of. Shame on the curators of this property for not doing their best to provide a good, clearly explained educational experience for the people who pay to see the site. 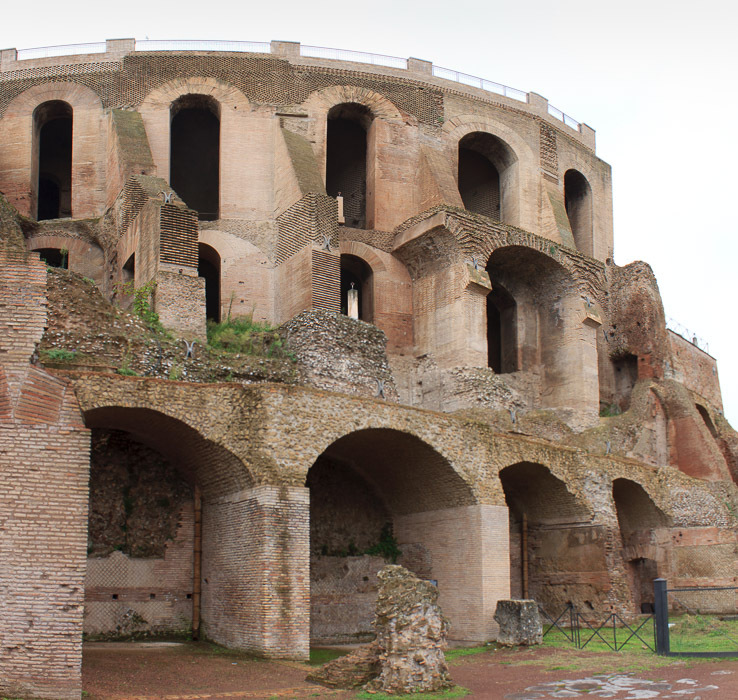 However, it does have the remains of the palaces, and some of them have enough standing to make them worthwhile to see, so although I would not go onto the Palatine Hill if I had less than 4 days in Rome, I would (and did) go when I had only slightly more than a week. And I went again when I took a second trip to Rome, hoping to be able to make more sense of it. It was still difficult to understand, though. 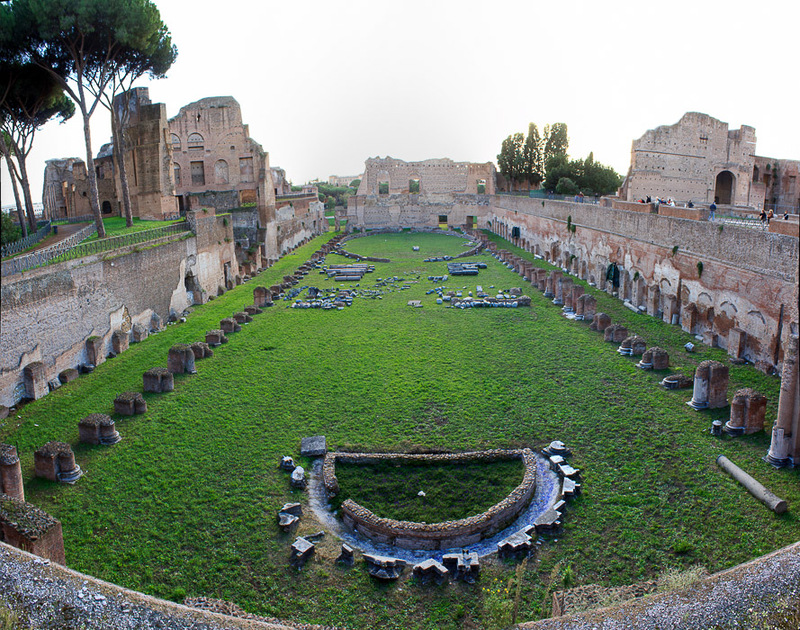 See all Palatine Hill photos. 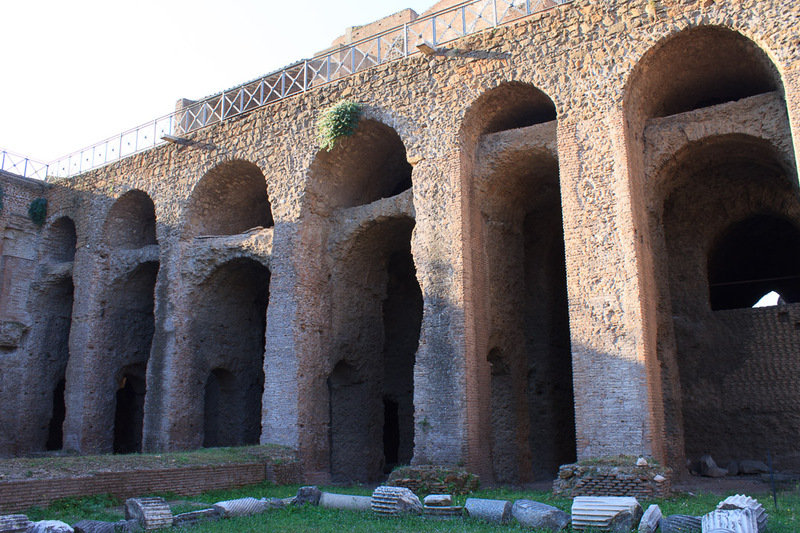 The Palatine Hill entrance on Via di San Gregorio is a great place to buy your combined ticket for the Palatine Hill, the Colosseum and Roman Forum since the lines there are shorter than at the other two sites. 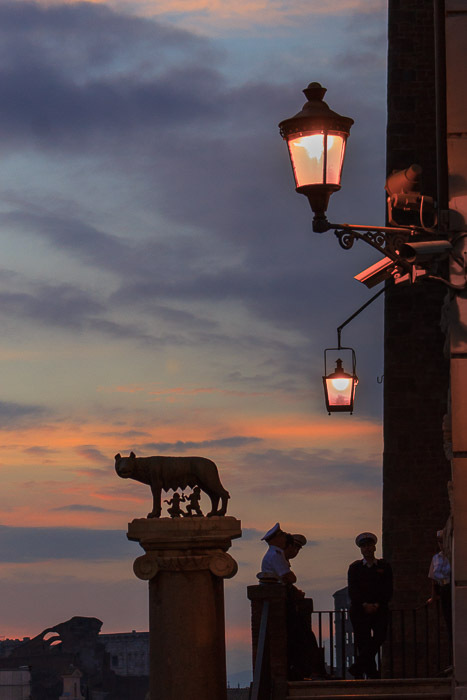 To get there, walk from the Colosseo metro stop, past the Arch of Constantine, and continue about 1.5 times that distance in the same direction where the entrance is on your right. 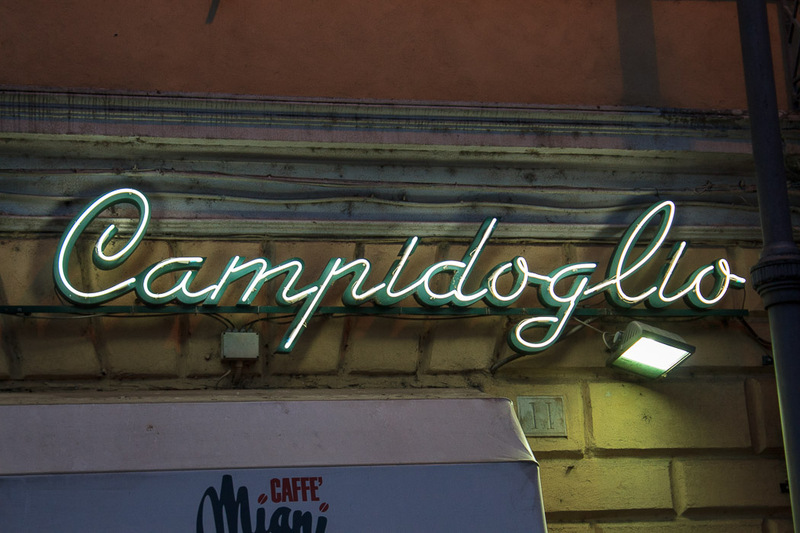 Regardless of where you buy your ticket, though, you can enter at either the entrance on Via di San Gregorio, or from inside the Roman Forum, near the Arch of Titus. Just south of that Via di San Gregorio entrance are remains from an extension of the Aqua Claudia made by emperor Domitian to bring water to the Palatine Hill. 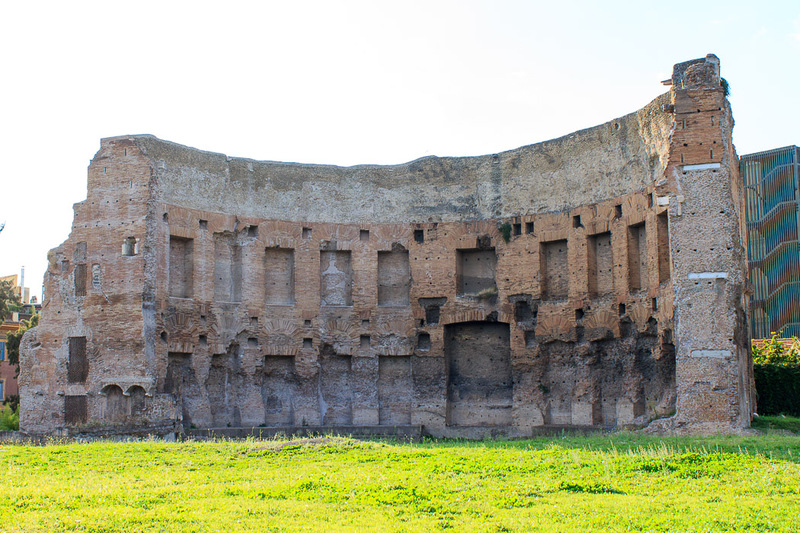 One of the larger and better-preserved palaces on the Palatine Hill is the Domus Augsutiana, named after Augustus, but built by the much later emperor Domitian. Photos are below. 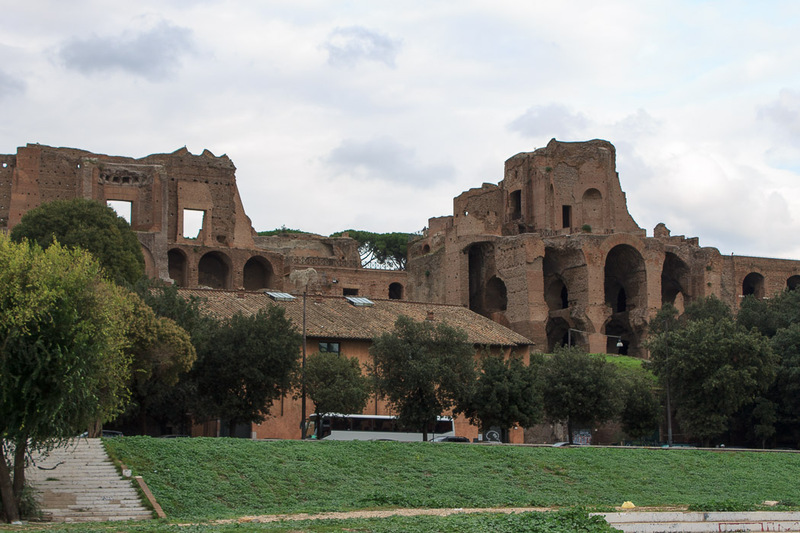 These ancient ruins on the Palatine Hill (photos below) predate the imperial palaces, and even the Roman Republic, and correspond in time to when the creation legend of Rome states that Romulus lived on the hill, so are called the Huts of Romulus. 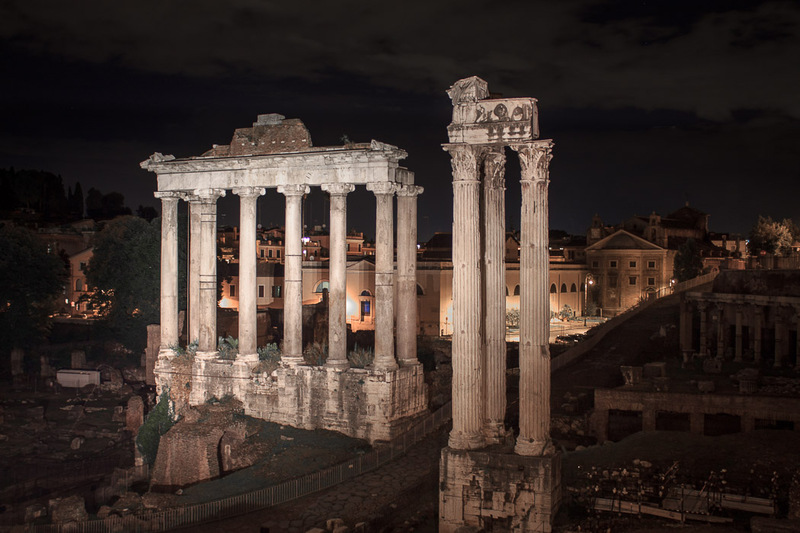 They have been excavated on and off for a century and are perhaps the most sacred site in ancient Rome, being the believed location of the house of Romulus, legendary founder of Rome. The buildings are viewable from a platform above, but you cannot walk among them. 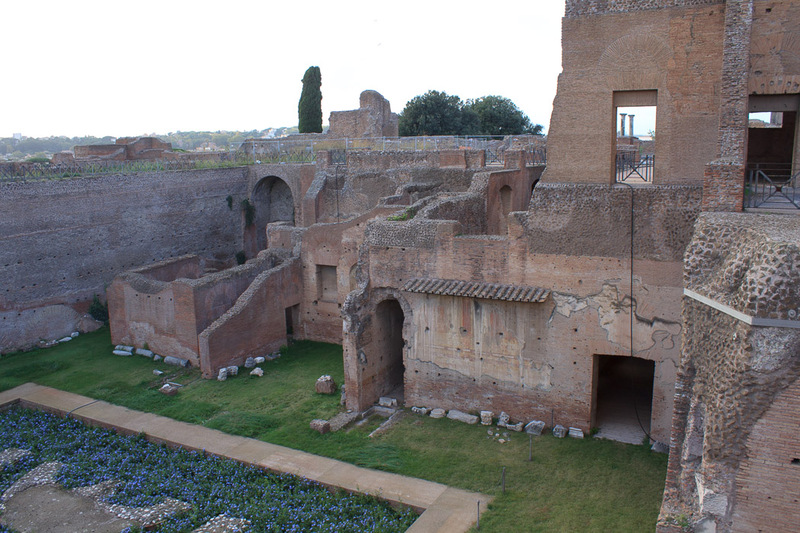 The Severan Arcades (The palace built by Septimius Severus, built over substructures apparently dating from the time of Domitian) overlooking the Circus Maximus from the southern edge of the Palatine Hill (1st photo above) are shown in closer detail in the photos below. 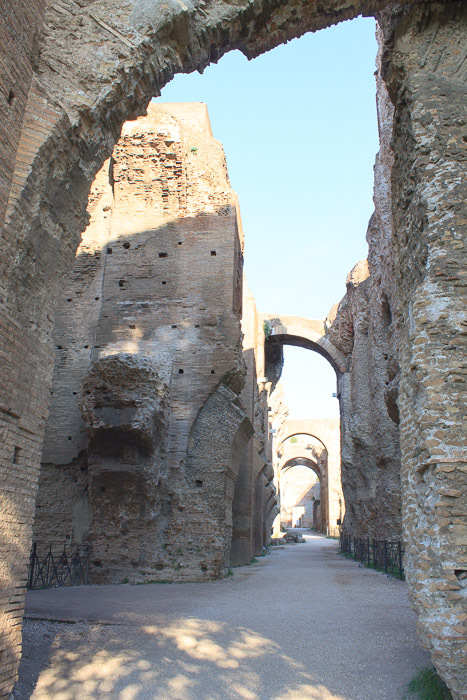 The Neronian Cryptoportico was a closed passageway between the vestibule of Domus Tiberiana and the House of Augustus. 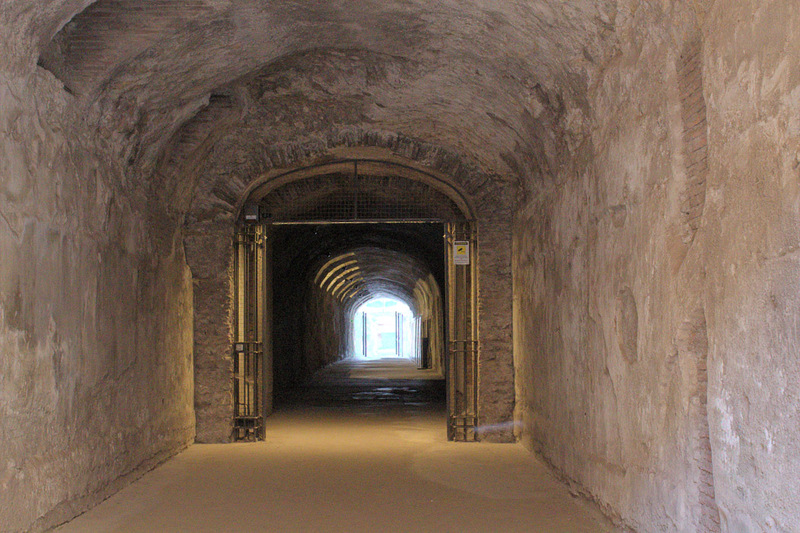 The inside of the passageway is shown in the 1st photo below, and an archway still decorated with ancient artwork is shown in the 2nd photo below. 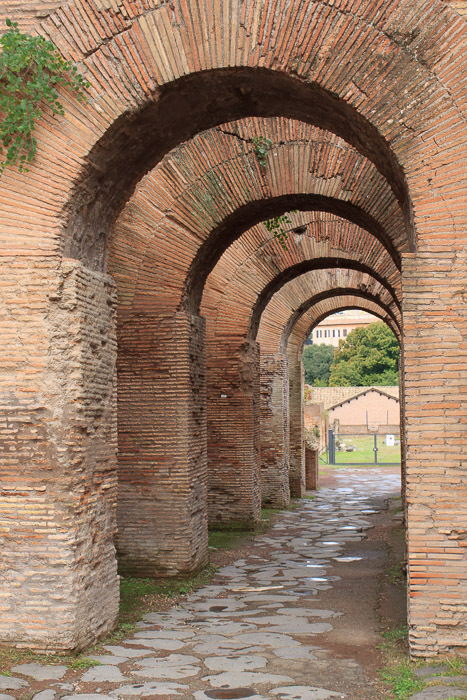 Details from that archway are shown in my Palatine Hill photos. 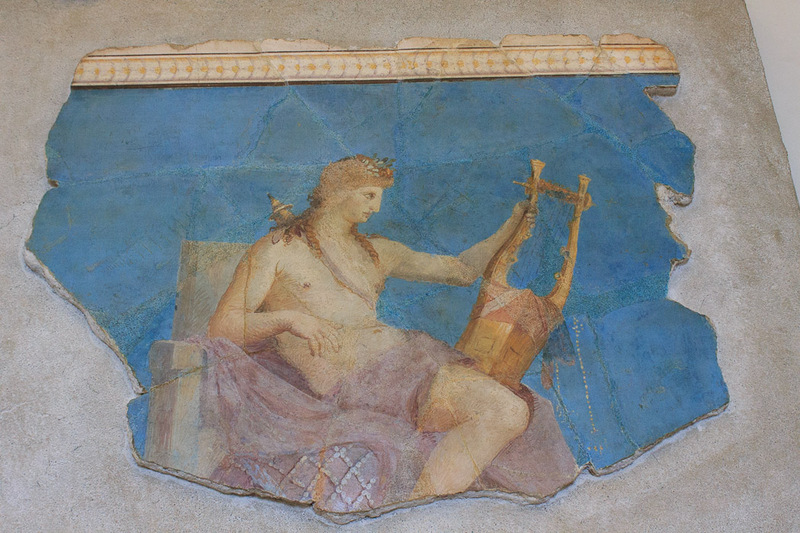 A small museum on the Palatine Hill has a few interesting objects and goes quickly since it is quite small. 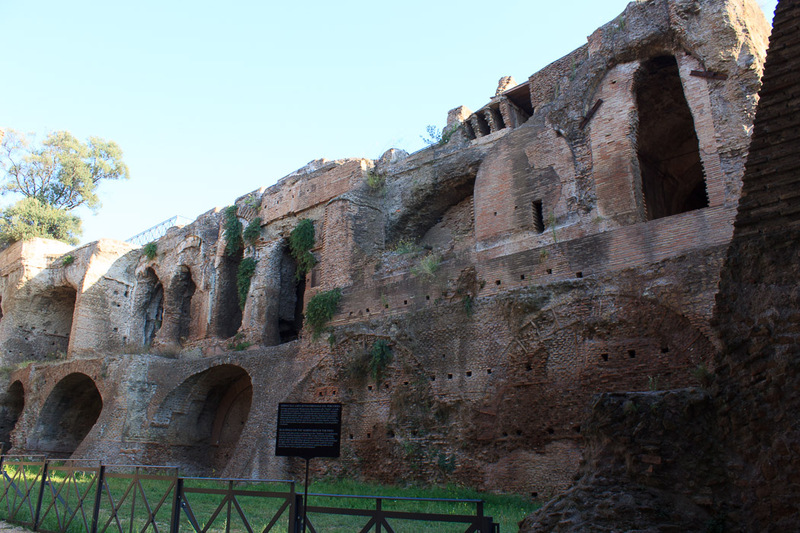 The first time I visited the Palatine Hill, I was hot, tired, and it was late in the day so I skipped the museum. 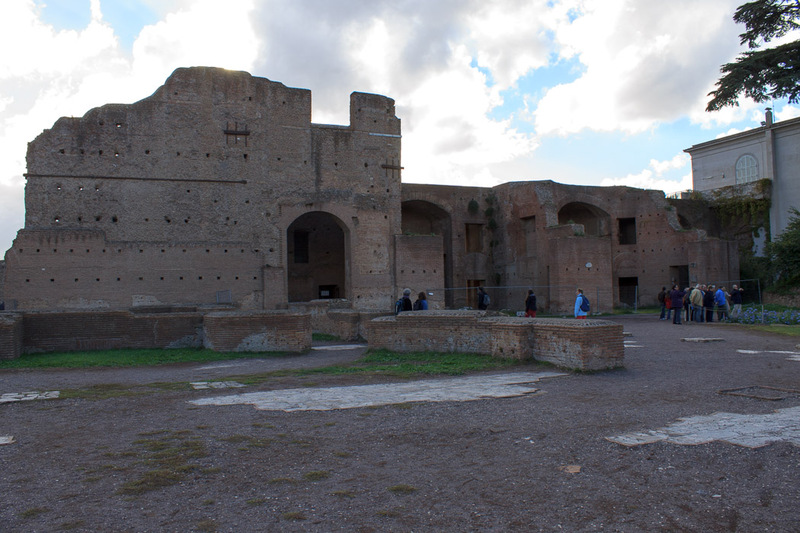 The second time I visited the Palatine Hill, the museum was completely closed for some reason, and the third time I visited the Palatine Hill, the first floor of the museum was open, where I took my pictures, but the ground floor was closed. Unfortunately a lack of care for the tourist is the predominant feeling I have gotten from the entire site -- the museum is closed without notice at the ticket office, the signs are poor throughout the site, and there is no marked route that matches what's shown in the guide sheet that you might or might not get when you buy a ticket, depending on their supply. The fountain marked as the Theatre of the Great Fountain on the Palatine Hill guide map that you're handed when you buy your ticket (if you're lucky and they haven't run out yet) is a Nymphaeum named Fontana della Pioggia. 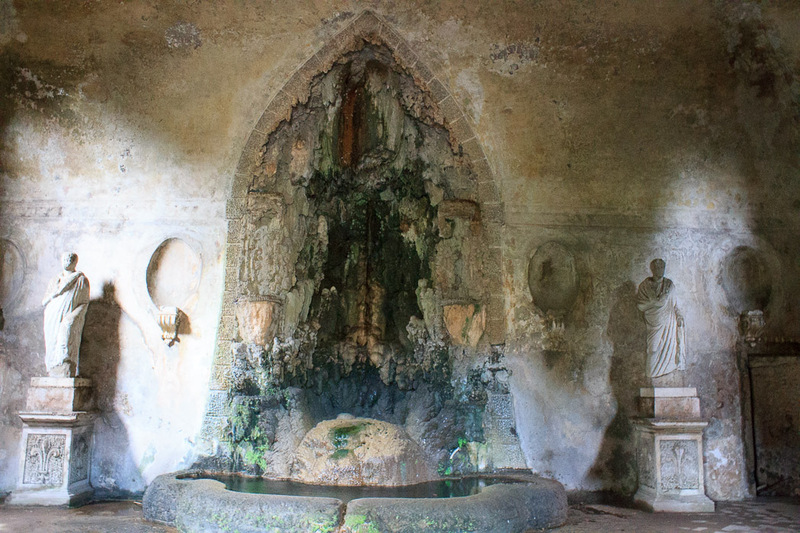 It is an artificial grotto in Orti Farnesiani meant to mimic a natural cave that Romans often used to escape the heat of summer. 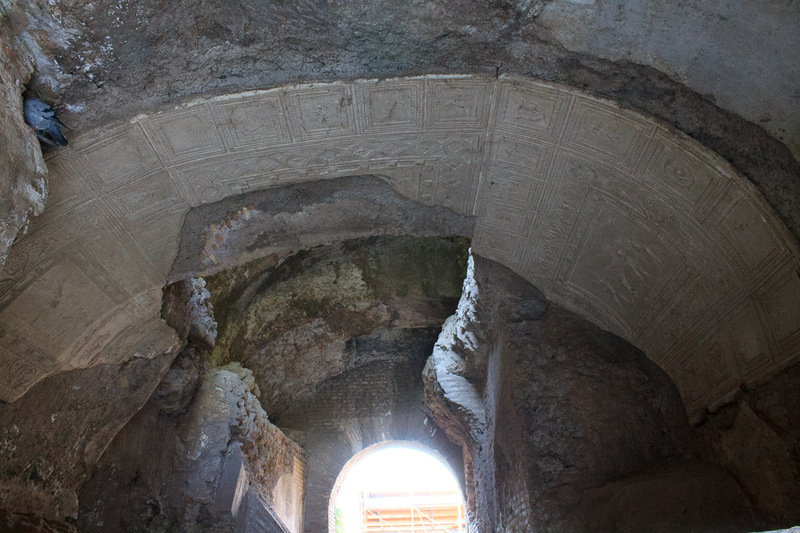 And finally, a few more pictures of and inside Domus Tiberiana. 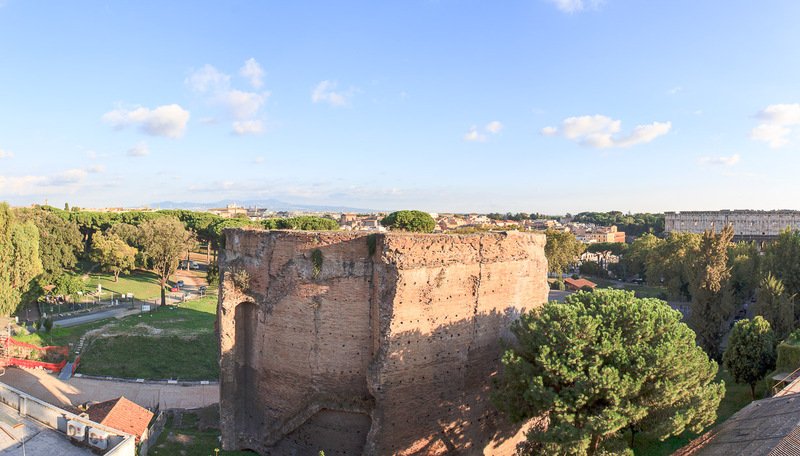 The 2nd and 3rd photos below are taken along a path that takes you to the north facade of Domus Tiberiana, right at the edge of the Palatine Hill, with the palace on one side of you and the Roman Forum displayed to you at the bottom of the hill on the other side of you. It's quite a remarkable spot, with beautiful views. Being one of the Seven Hills of Rome, I took Panoramic photos of the view from the top of the hill. The photos below show those panoramic views. 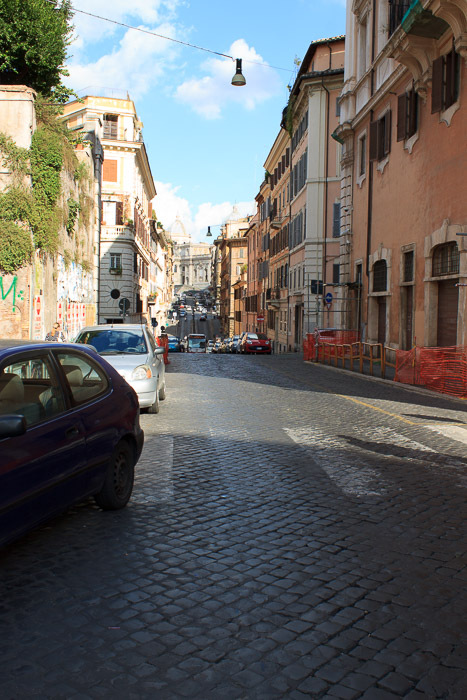 Location: One longish block south of the Trevi Fountain, then one longish block east. 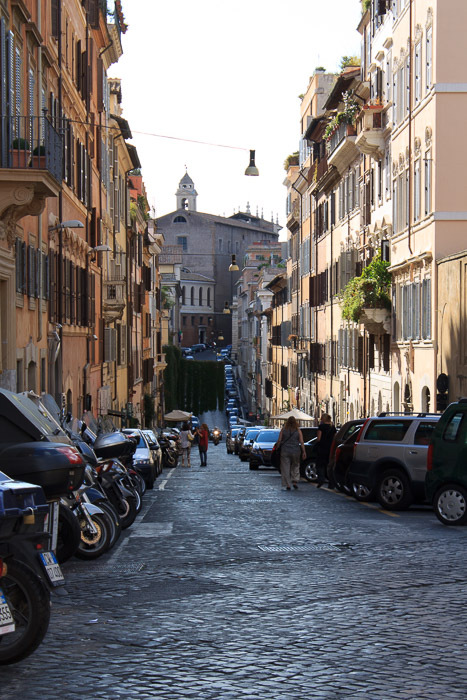 The Quirinal Hill is one of the Seven Hills of Rome. 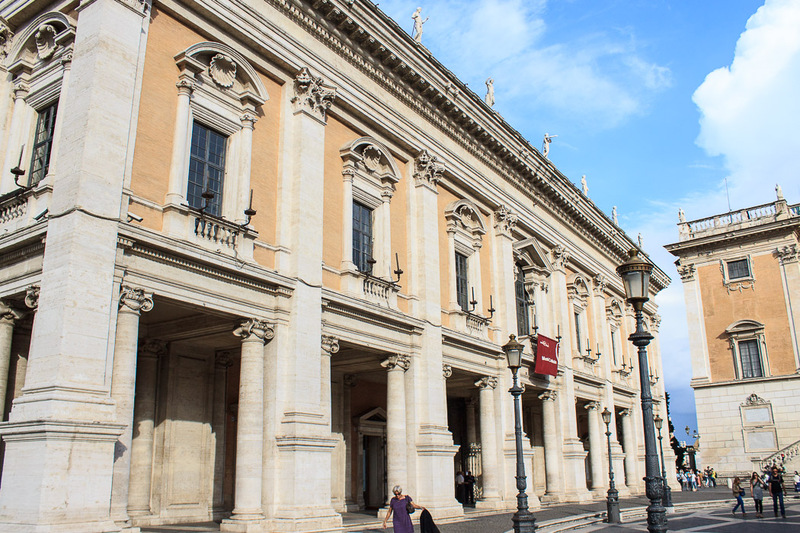 At its peak is the Quirinal Palace, the official residence of the Italian President. But the entire hill is quite large, ranging south from there to the northern edge of the Imperial Fora. The hill was likely a small village of the Sabines during the 8th and 7th century BC, and became part of Rome during the 6th century BC. 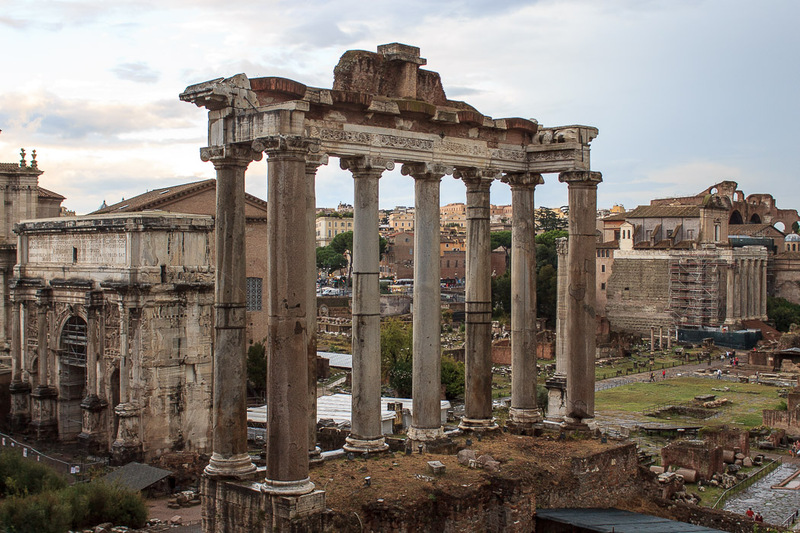 Many ancient sites once located on the Quirinal Hill are now long gone, including a temple dedicated to Mars built by Augustus, the Gardens of Sallust, and the Baths of Constantine. 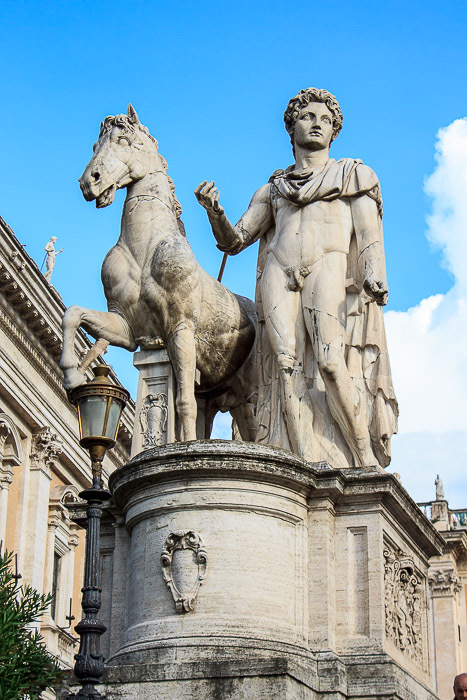 Sights today on the Quirinal Hill include the Fountain of Castor and Pollux and the Quirinal Obelisk in the Piazza del Quirinal, the Four Fountains, the Triton Fountain in Piazza Barberini, and the Trevi Fountain. Oops, I didn't get a panoramic photo from the Quirinal Hill, but I took the photos below facing west from Piazza del Quirinal, near the summit of the hill. See all Quirinal Hill photos. The Viminal Hill is the smallest and most difficult to find (for me) of the Seven Hills of Rome. It's peak is a few blocks due south from the Four Fountains, around Via Nazionale and Via Milano. The hill is located between the Quirinal Hill to the northwest and the Esquiline Hill to the southeast. I didn't take a panoramic photo from the peak of the Viminal Hill because I couldn't find anyplace that looked out over a vista. Buildings always blocked the view. Instead, I post the three pictures below which were taken down streets from what I think might be the peak of the Viminal Hill. See all Viminal Hill photos.